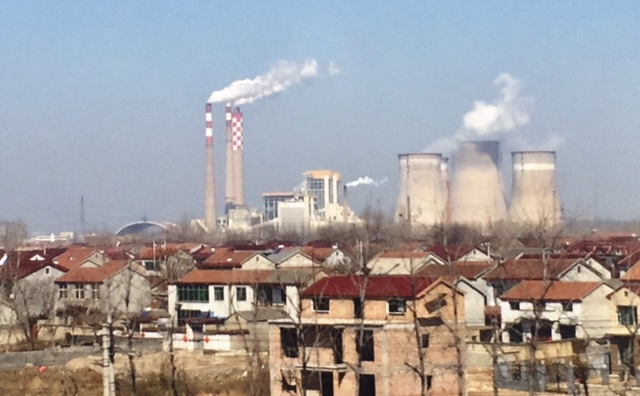 I was only marginally accurate in my expectations … but, there is so much more to China than I ever considered! I have to begin by saying that our journey through the Middle Kingdom was made exponentially easier by traveling with good friends fluent in Mandarin. 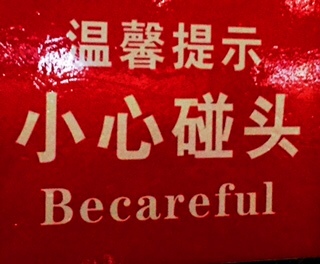 Yes, some businesses and taxi drivers do speak limited English, but it is very, very limited. Jeremiah prepared for the trip for about eight months working part-way through Rosetta Stone’s Mandarin program. He also created and printed a list of common phrases, pictures of important things (e.g. 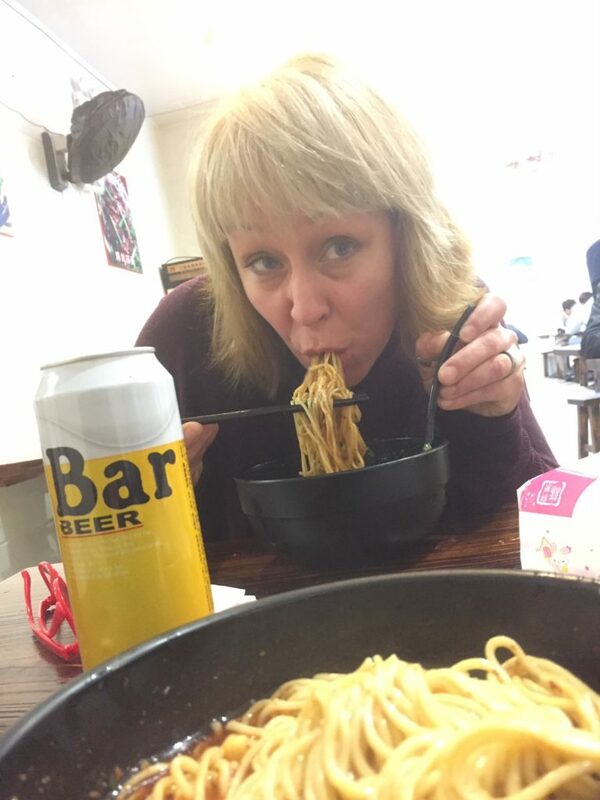 noodles, train, toilet, beer) in simplified Chinese characters, and pictures of hotel and train station addresses along our route … I, conversely, flew completely blind and culturally unprepared. Here is what I learned, in a nut-shell: Chinese are a lovely, proud people. Proud of their culture, skylines, cutting edge technological advancements, photographs, and language. The more I witness and learn, I think they have every right to be proud! There are things in China that make my brain spin (mostly in awe rather than disbelief). Don’t get me wrong … I am painfully aware of the obvious ecological issues plaguing this vast nation. One day in Shanghai (and worse yet, Xi’an) and my throat and eyes were begging for mercy from the chokingly polluted air. Similarly, my heart sank as we flew over heavily traveled sea cargo lanes, drove through land masses formed from compacted trash, and discarded dizzying volumes of plastic packaging during our stay. This nation is far from perfect, but their accomplishments are wondrous. I believe that more of the world’s future is influenced by China than we may want to admit (for better and worse). our trips. 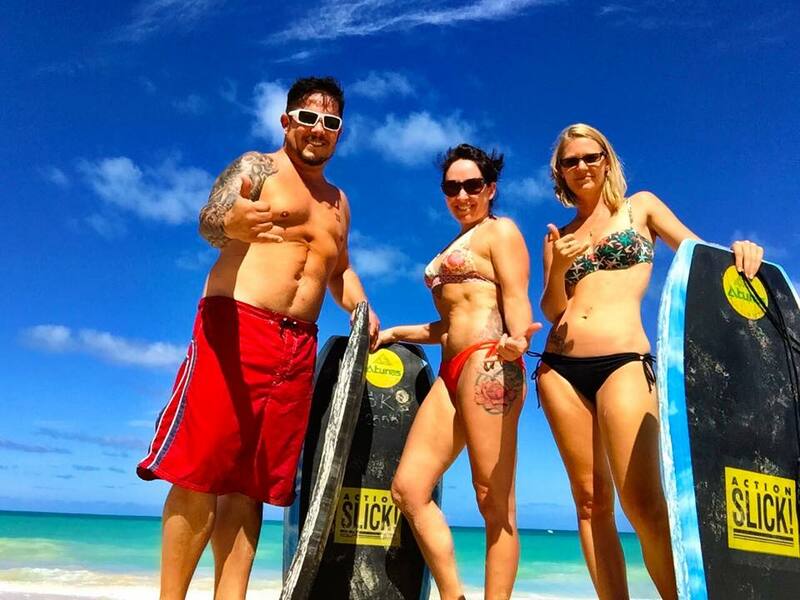 Through trial, error, and word-of-mouth, he has gleaned a handful of little-known travel planning websites that are huge assets if you like to travel and save money. Preparing for this trip he used an online Chinese travel website called C-Trip to book really great deals on airfare. 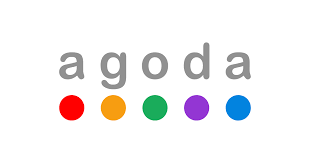 His favorite go-to lodging website is, hands-down, Agoda. 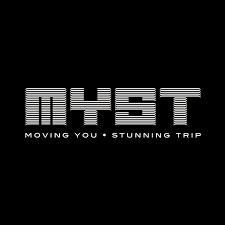 Travelers of all budget ranges (hippy backpackers to high-rollers) can find deep travel discounts to fit their style on both sites. We save hundreds of dollars each year just by using these two websites! From the Seattle-Tacoma International Airport we enjoyed a sparsely populated direct flight on Hainan Airlines to Shanghai’s Pudong International Airport. 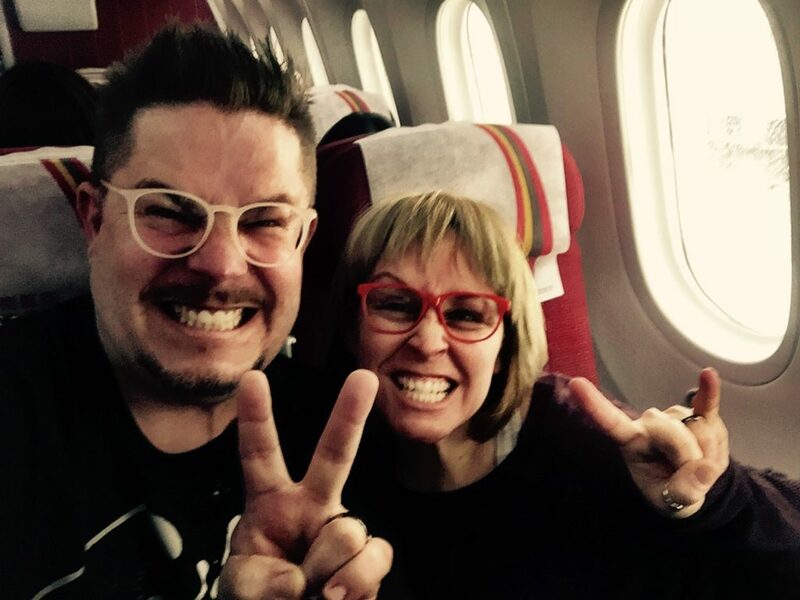 I wish all international flights were this enjoyable (and roomy)! We arrived mid-afternoon on a breezy Tuesday feeling moderately well-rested. Greeted by friends at the airport, we were promptly whisked to the taxi queue and began the 50-60 minute journey into the heart of Shanghai. As Jeremiah is a huge fan of exceptional views, we allowed ourselves to splurged on a room at the Grand Hyatt Shanghai for this first stop. 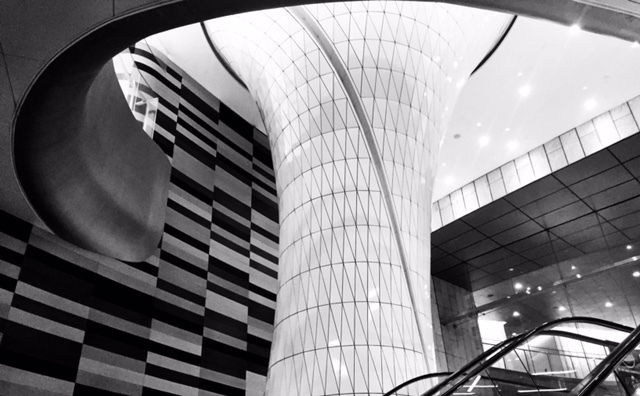 The hotel itself is gorgeous; rich woods, countless mirrored surfaces, intriguing traditional Chinese design influences, and Hyatt’s impeccable presentation. 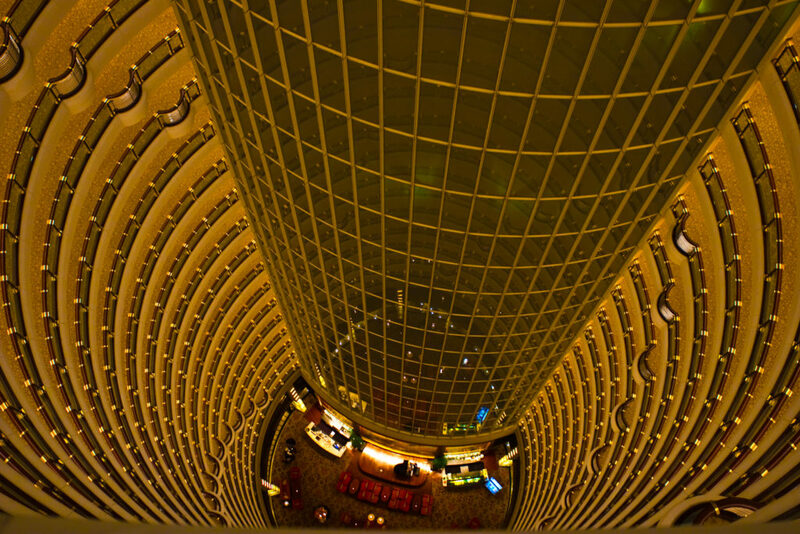 Our room was located on the 78th floor of this staggeringly tall building. One entire window wall of our hotel room faced the Oriental Pearl Tower, Shanghai World Financial Center (affectionately nicknamed the ‘Bottle Opener’ by locals), and Shanghai Tower with the Huangpu River winding just beyond. I could have never left that room and still felt as if I had experienced something amazing in Shanghai … but we were just getting started! This adventurous couple shares a kiss under the captivating Shanghai skyline they love. 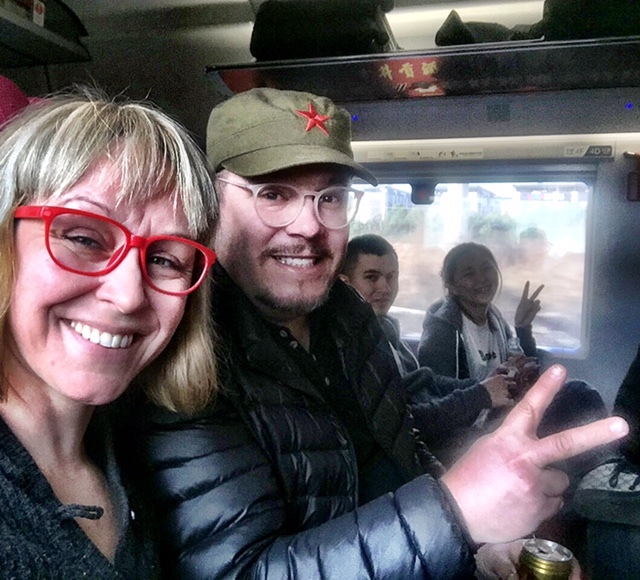 Our travel companions have both called Shanghai home at different times in their lives, so they were excited to introduce us to their local friends and enjoy the city’s glamorous nightlife. There was no time for jet lag today! Quickly, we settled into our room and freshened up. Within two hours of our arrival we were, again, out the door. Hakkasan Shanghai is a beautiful stop for dinner or a quick drink before a night on the town. We met up with an intimate group of vibrant, well-educated friends for dinner and drinks at Hakkasan. I highly recommend at least stopping here for one of master-bartender, Alan’s, scrumptious libations! I fell in love with a rosemary-infused gift to my taste buds called “Jade”. 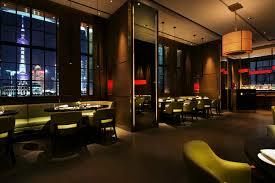 The restaurant is comfortable yet elegant. The dining room offers intimate seating areas decorated in rich jewel tones, supple fabrics and skirted by a stunning view of the Shanghai skyline. Moving on from the restaurant, our growing group cozied up in a couple of taxis in search of someplace to get our boogie on; we found it at Myst. From the street we could barely hear the faint rhythm pulsing from inside. We climbed the wide, black staircase to the club’s entrance. Almost as if my hesitation was expected, the neon red-lettered sign on the wall of the upper floor’s landing teased, “ARE YOU READY?” I’ll admit it now … my jet-lagged brain was NOT ready for the sensory overload that followed. The doors swung open into a gymnasium-sized room literally vibrating from the music inside. 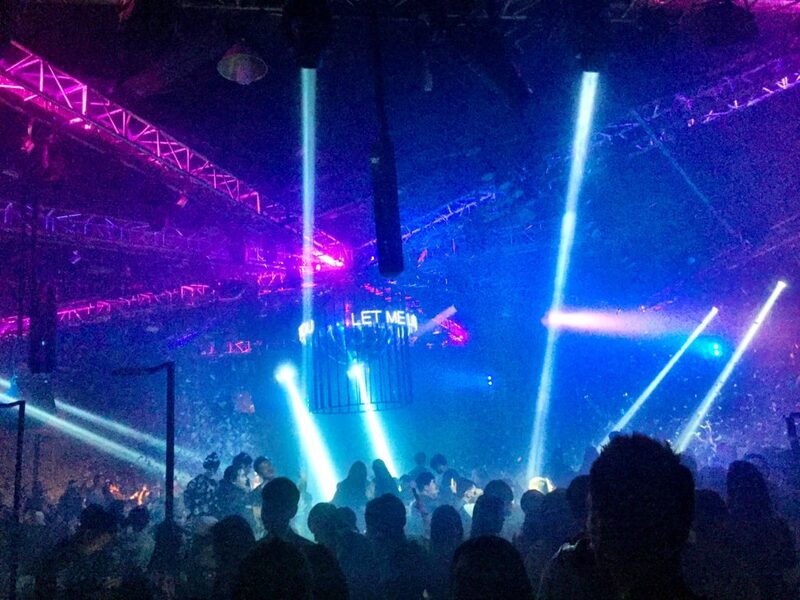 Blue and white lights pulsed over the teeming mass of dancing bodies on each of the club’s three levels. The entire wall behind the DJ booth was a digital kaleidoscope of light and color, ever changing with the beat of the music. What a party! As if to punctuate the festivities, confetti rained down on us at regular intervals. We took turns throwing handfuls into the air and dancing it into paste underfoot. We finally slunk back to our hotel around 6:00am as the sun began to rise over the waking city. 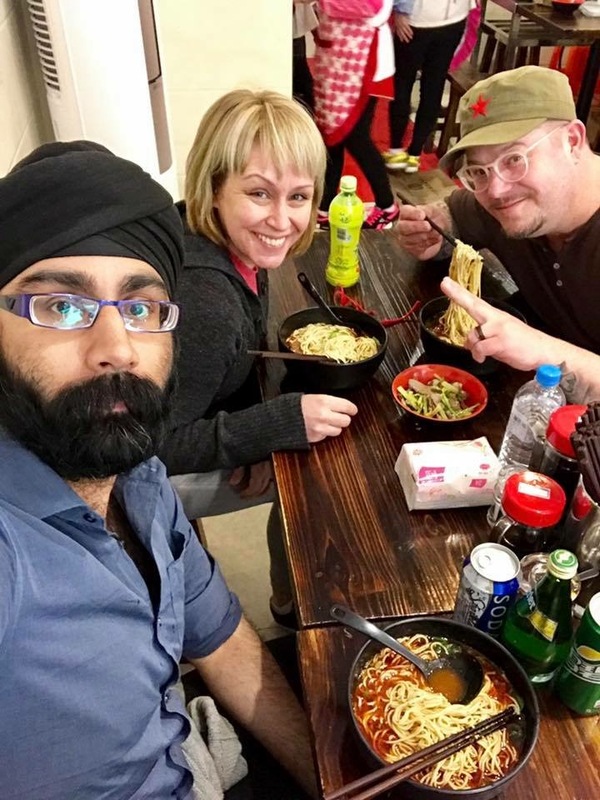 We awoke only a few hours later to the call for a brunch of spicy Chongqing noodles we were told would “change our lives”. These noodles originate from the Chongqing area in southwest China and are called ‘xiao mian’ in Chinese. Xiao mian refers to a group of plain noodles seasoned with vinegar, sugar, red oil, ginger and scallion. Sometimes the noodles and broth may be topped with meat. 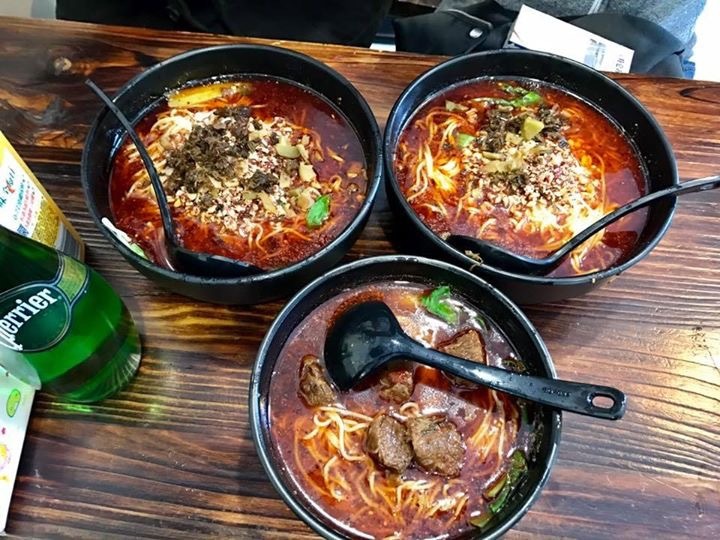 Noodles in northen China emphasize the soup base and the quality of noodles, while Chongqing noodles are focused on seasonings. 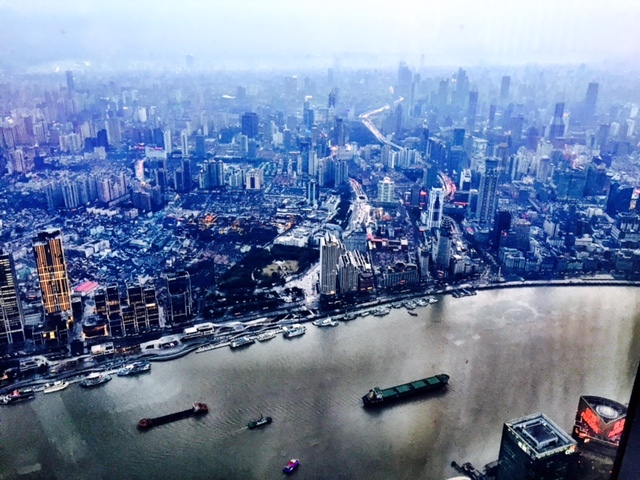 We taxied under the Huangpu River to West Nanjing Road much the same as we had the evening before. As we drove through this sprawling city I couldn’t help but think that all of the storefronts seemed identical. Perhaps not identical … but a succession of the same stores repeated in random order. At one such row of non-descript storefronts we exited the cab, entered an unlabeled, white facade building, and ordered several bowls of spicy beef noodles with peanuts and greens. Upon arrival, there was nothing noteworthy about the appearance of this restaurant. Workers sat at tables in the back corner mashing peanuts and preparing other foods; customers sat cafeteria-style at long wooden tables and hard, wooden benches; a handful of faded, framed pictures of various soup dishes lined the walls at eye-level, and we even brought our own tissues/napkins and drinks (purchased from the convenience store across the alley). The noodles, however, did make the world right again! Our oversized bowls were served brimming with crushed peanuts, chopped greens, strips of beef, broth, and noodles hiding below the surface. The slightly oily broth was fiery red throughout, dotted with orange and red chili flecks. We anxiously cooled our dishes and then happily wept as the spice filled our senses (and sinuses). I am so glad I packed extra tissue packets! Even though we were achingly full at the end, friends still eagerly picked over the empty bowls for any morsels left behind. Late morning gloom turned into rainy afternoon skies and chilling wind. We gathered with friends again as dusk fell and headed out to glimpse the lights of the city. 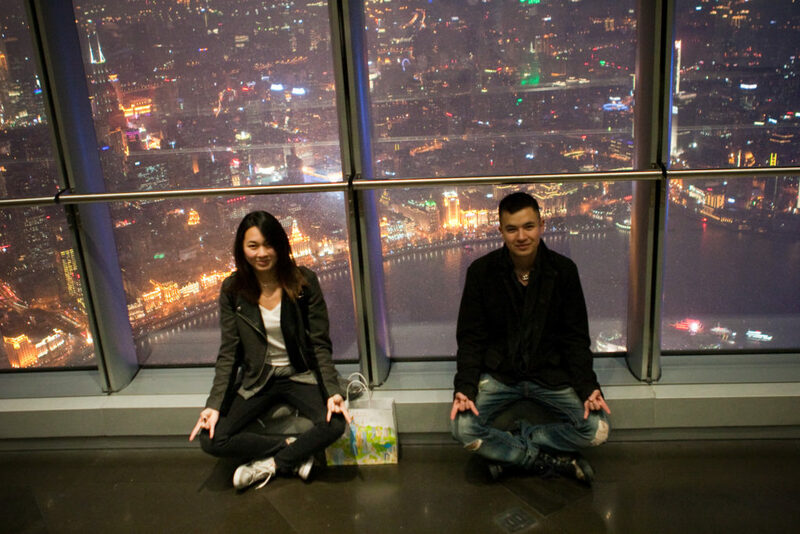 We started the evening with a sunset view from the second highest observatory in the world, the 119th floor of the Shanghai Tower. 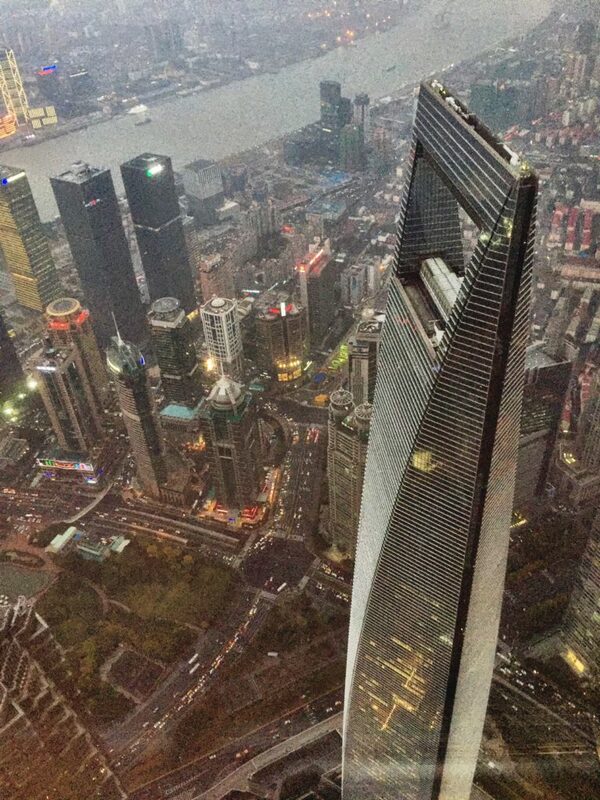 Fun Fact: the Shanghai Tower stands, currently, mostly empty. Yes, this 137 floor behemoth of a skyscraper (5 basement levels, 127 floors above ground and 5 podium floors) uses electricity (daily) on every floor, and only operates businesses on a few of the basement levels. Weird, right?! Anyhow, we wound our way from the entry ticket counter (the price for taking the elevator to the sightseeing deck is CNY 160 per adult, CNY 90 for children between 3.3 and 4.6 feet, and this service is available from 9:00am to 9:00pm) down several levels of spacious escalators to the stark white, and very dotted escalator queue. Entering the elevator meant passing (for an ever-so-short moment) over a howling gap filled with biting air. The ride was lightning-fast (55 seconds to travel up 119 floors) and so smooth. As we reached our stop, the car swayed and stalled in its tracks and sent all our stomachs to our feet. Jeremiah glanced down the chasm while exiting and stopped in his tracks. He held onto the door, swayed, and giggled nervously. I hate heights, so I nudged him impatiently forward without looking into the abyss between. The mouth of the elevator emptied into a beautiful yet simple doughnut-shaped space ringing together an observatory deck, gift shop, gut-clenching simulated shattering glass floor (complete with sound), seated cafe area, and local-area history placards. On the north side, the evening’s storm whipped rain against the glass and only offered limited visibility. The southeast lit up bright along the winding industrial riverside. Finally, the sun went down in the west beyond the Bund area in a haze of smog and rain. Every visitor walked laps around the observatory taking in the enormity of the structure as an accomplishment … and the view didn’t hurt! I imagine that vantage probably allowed you to see for 50 miles on a high-visibility day. 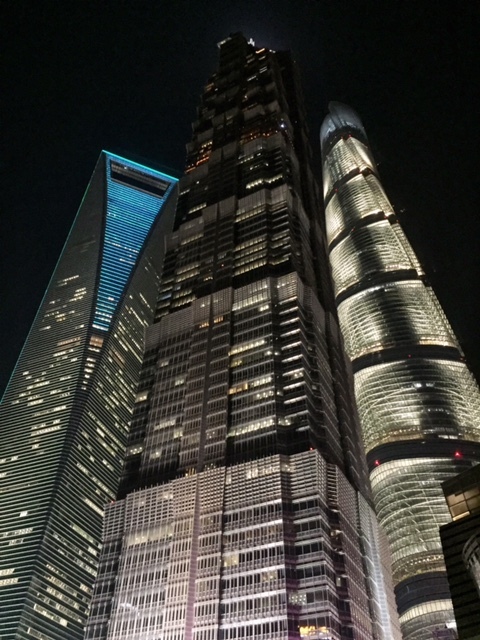 The Shanghai World Financial Center appeared dwarfed by the new Shanghai Tower and I couldn’t help but be amazed at how quickly the Chinese culture strives for the next great thing, even to the end of one-upping itself. I heard there is another tower being built in China now which will be taller than the Shanghai Tower … wow! Admittedly, the sunset in Shanghai wasn’t nearly as beautiful as the colored lights that began to dazzle us from the land below. 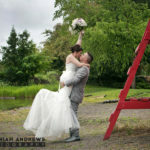 Playful couples in spectacular cities make taking amazing photos fun! 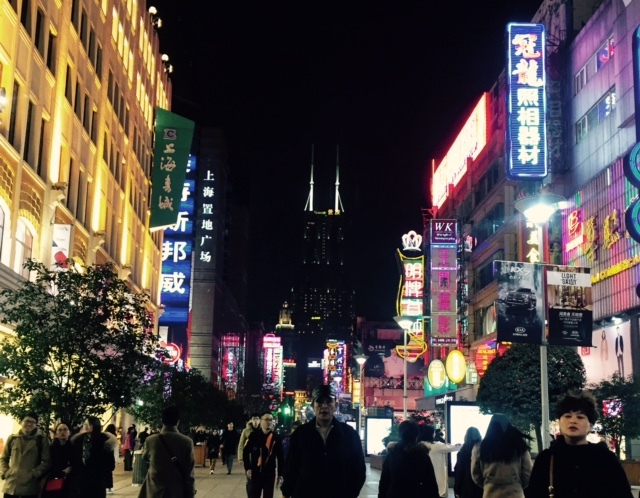 The landscape of Shanghai at night is stunning. Bright, dazzling lights adorning buildings, new and old, in a wash of vivid color. What an amazing time to take lifestyle photographs of some great people! 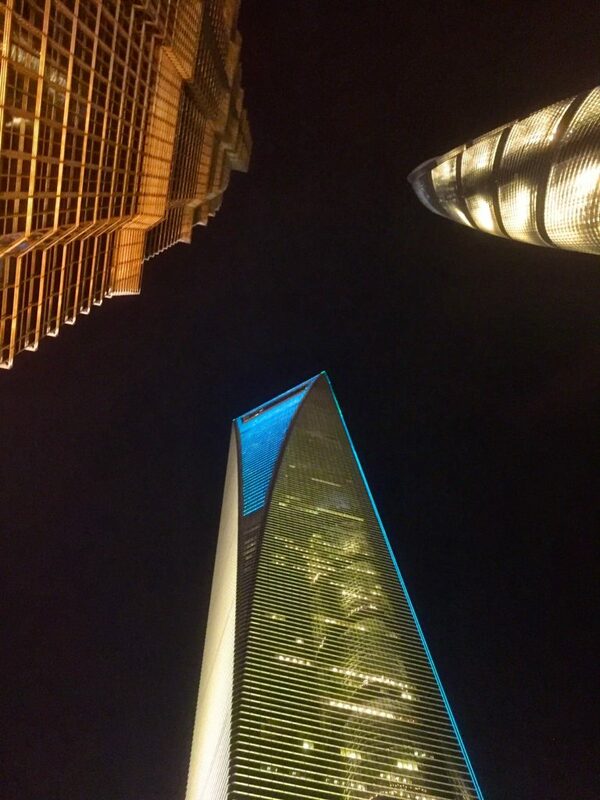 On the city streets of Shanghai, at the feet of these glass and steel sentinels we were (moments before) standing atop, the love for Shanghai our friends share came alive in electric images. We played with depth and perspective to capture the scale of the surroundings and had a blast creating a long exposure image of the couple hugging amidst the busyness of Nanjing Road (know as one of the most traveled shopping streets in the world). Across the Huangpu River on the Bund, Jeremiah was able to capture the couple’s favorite view, the whole Shanghai skyline, with them front and center. 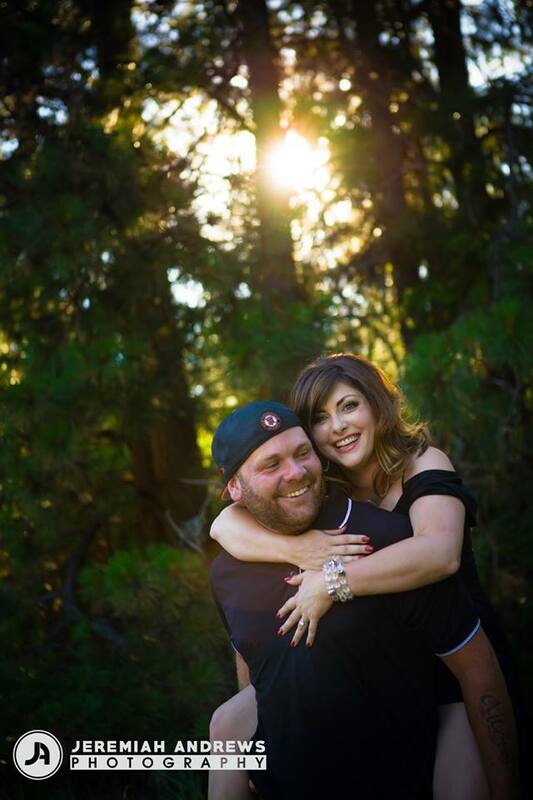 Location photography sessions in an area of significance to a couple are always special! The subjects’ familiarity and pride in their surroundings comes across in the images we create … the results are magical. Late night bites at a no-name shop don’t get much better than this … frog, fish, and spicy green beans, oh my! We rounded out the evening with a late-night supper of grilled frog, pickled and spiced green beans, and a whole baked fish at an unassuming roadside cafe and liquor mart. I had never tried frog before and was pleasantly surprised. 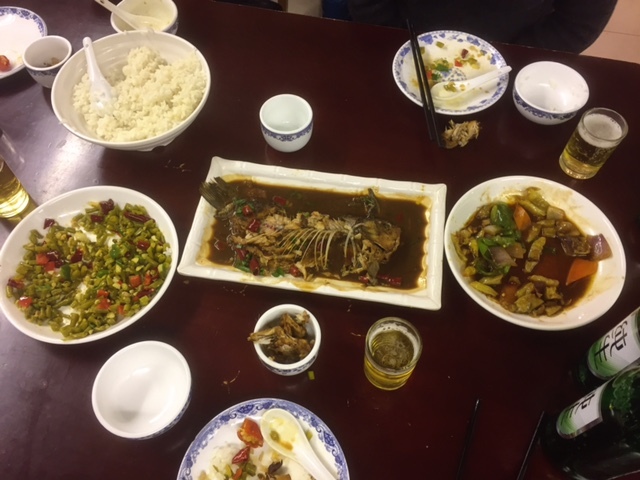 The mild white-meat flavor of frog is worthwhile, but I did find that the little bones throughout proved difficult when trying to negotiate with chopsticks … I managed fine once I got the hang of things, though. As the city slowly grew quiet and the glistening lights of storefronts fell dark in the late night hours, we walked contentedly back to our hotel for much needed rest. 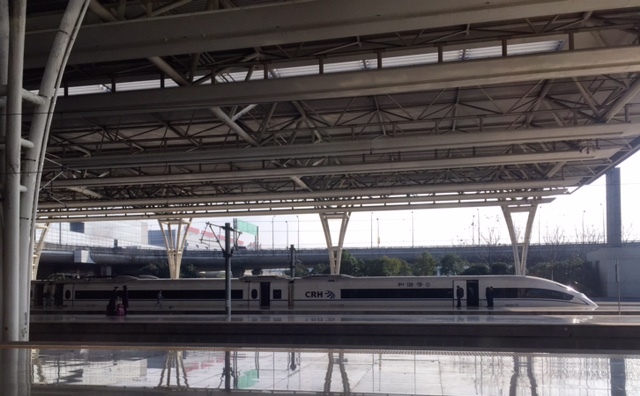 Tomorrow we would board a fast train for Xi’an and the ancient Terracotta Warrior Army excavation and exhibit site. Although exhausted, we each buzzed with excitement for the adventure to come. I am forever trying to make sure that the gifts I give to those I love are: 1. personal, 2. useful, and 3. cool as hell. For this reason, the practice of purchasing and distributing mass Christmas presents vexes me like none other. Instead, I spend months collecting (and hiding) bits and bobs from flea markets and thrift stores in the anticipation of sharing a singularly unique gift with someone I adore. 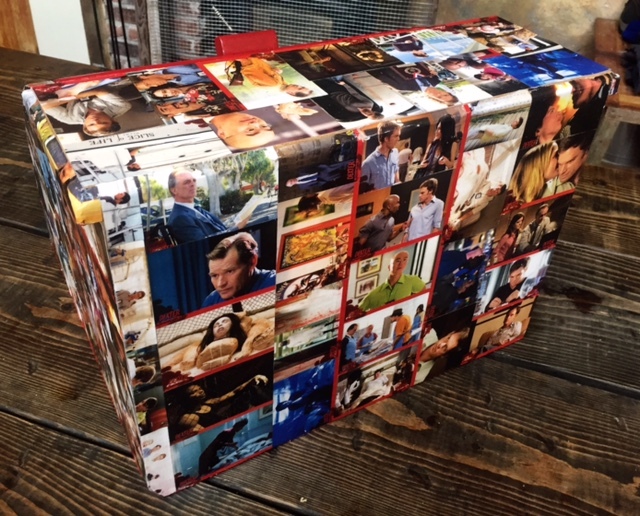 This year I was able to pull together a fun and unique kitchen accessory for my wonderful husband … a Dexter themed breadbox! Before you laugh at the absurdity of a breadbox as a yule-tide gift for my loving man, be advised that this is perfect for him in two ways: 1. He LOVES all things Dexter; 2. The kitchen is his playground, the rest of the family merely borrows it from time-to-time. As an aside, the kitchen is already decorated in a Dexter motiff (complete with crimson red walls and Dark Defender art). The idea was born mid-September when I found a rather sad and totally plain particleboard breadbox while making the rounds at my fav. local thrift stores. Painting wouldn’t really do much for this particular piece as the surface was uneven and porous (not to mention the particleboard was dented on a back corner). 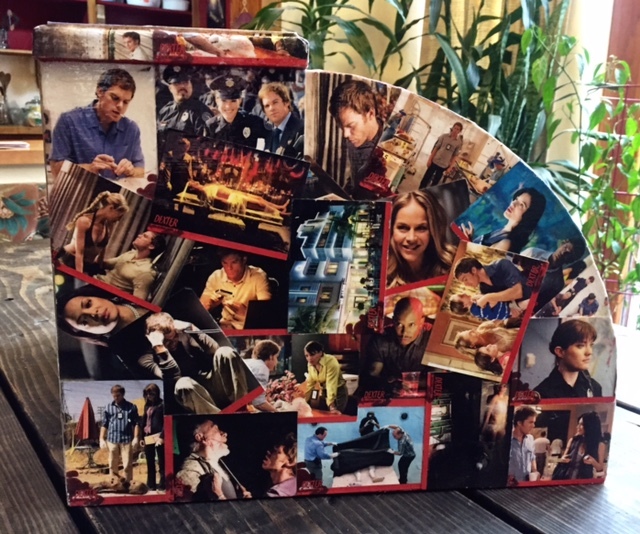 I had wanted to try my hand at decoupage, so this seemed like a wonderful trial project. Before I began this DIY project I remembered to take a picture. 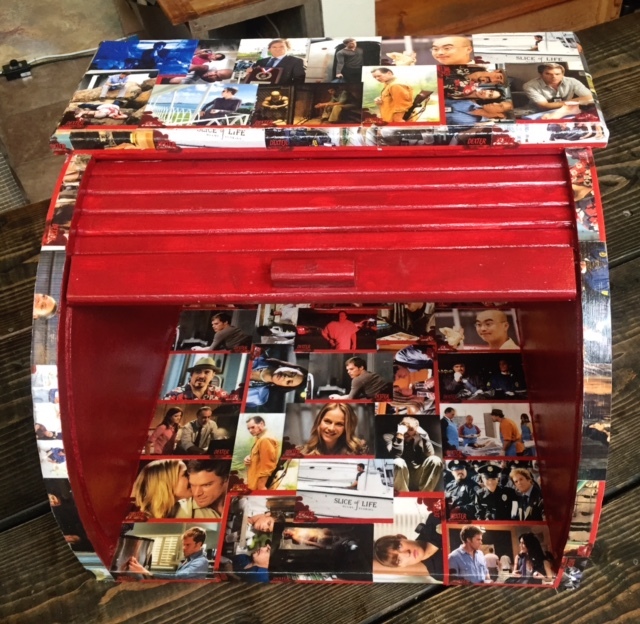 I started by paiting the roll down door of the breadbox before getting to the business of decoupaging Dexter collector cards onto all sides (inside and out). I was careful not to gunk up the roll-top door with cards or paint. Again I set about the task of adhering paper to wood in some attractive manner. Admittedly, some cards were hurt in this process. The trick turned out to be peeling the cards apart … fronts from backs … each and every one. Yeah, that’s +/- 140 cards to anyone keeping track. I began placing Dexter cards on the left side of the breadbox. I ran a base row of cards and layered additional cards in a scattered (seemingly random) order. I did make sure to alternate characters and scenes next to one another … hardly random at all. 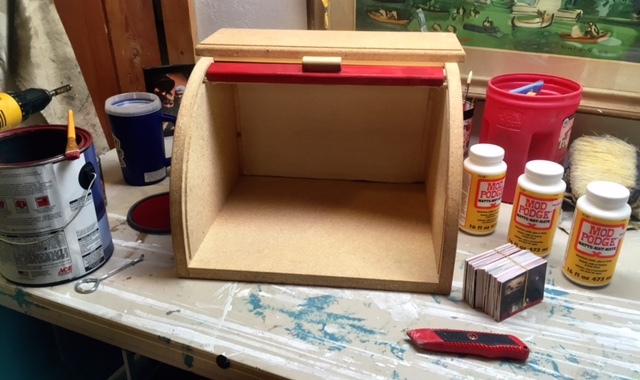 I applied Modge Podge to a rough 12″ x 4″ working area on the breadbox and the (now) rough back of a split card. I only used the cards’ front side since the backs’ content wasn’t varied. I placed each prepasted card onto the prepared work area and smoothed lightly into place with my finger and applied a liberal coat of Modge Podge with a foam brush to the card’s surface. I worked out any bubbles under the card at this time. NOTE: Work out bubbles diligently during this step to avoid sadness in your finished product’s quality. By the time I got to the right side of the box I knew my cards might run out before the project was done. I did allow duplicate cards, but tried to not repeat any one card on the same side. I applied the cards to the round edge of the breadbox and cut them to crisply follow the curve of the front after they had dried securely. I employed both random (overlapping/scattered) and patterned placement of the cards to create visual interest. On the sides of the box I let the cards overlap instead of cutting them at the points of intersection. The smooth surface of the end product was created by limiting my overlaps, and thinning cards where necessary. I was mindful to not overlap more than two cards at any one point to keep the surface area as smooth as possible. On the beveled edge of the box top I wet the back of the card and rubbed off additional paper until the card was pliable. Increased pliability allowed the card to contour to the rounded shape without cracking or distorting the surface image. Once I had covered the surface of each side I would let the cards dry before returning to trim excess edges and apply a second coat of Modge Podge. In total, I coated the entire surface four (4) times before applying a gloss sealer coat. On the back of the breadbox I ran the cards both horizontially and vertically. I used cut cards to trim the edges. Once placed, glued and dried, I trimmed excess edges with a razor before applying another coat of decoupage glue. As you can tell, I chose to paint the rolling door of the breadbox … the red ties the box into the colors of our kitchen and makes it pop! 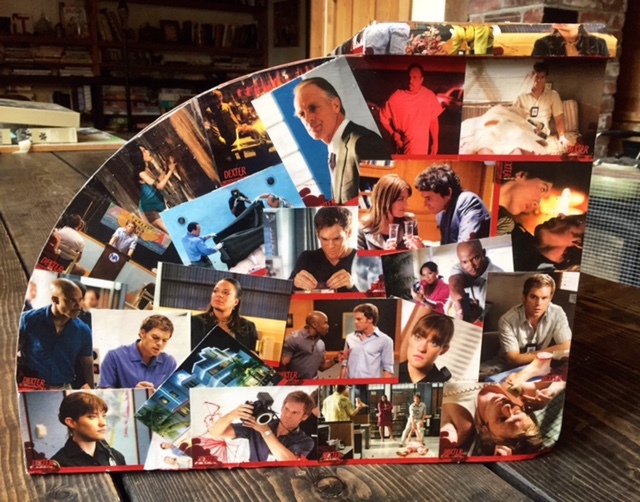 I had enough Dexter cards to decoupage the floor of the breadbox too! Here you can see the red paint continued on the inside walls, as well as get a good look at the cut edge trim pieces. In the end, my hubsy was happy with his rad, new splash of Dexter inspired color, and I was tickled to see another reclaimed treasure come to life … all in time for Christmas morn’! Final Product! 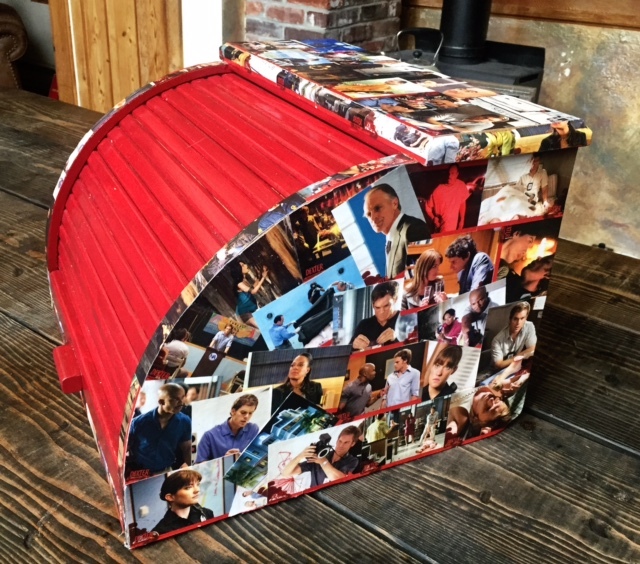 Dexter collector cards are decoupaged to this breadbox in an overlapping design for a personal and unique gift. My favorite Dexter fan will love this! Happy tinkering to all, and to all a good night. The Coeur d’Alene Wedding Chapel has stood as a proud sentinel at the corner of Wallace and 7th in the “Garden District” of Coeur d’Alene, Idaho for over 100 years. This majestic white brick church and adjoining garden are skirted on all sides by lush greenery and vibrantly colored blooms; a stark contrast to the blanket of grey rain clouds enveloping the city on this cold May day. We enter the garden gate and are immediately greeted by the tranquil gurgling of a water feature on the outdoor patio, followed by the happy bustling of preparations being made inside the tulle-laden reception hall beyond. We wound our way through the historic chapel and found our beaming bride in an interior room smiling from ear to ear as she looked at herself in the full-length mirror. Katie’s golden blonde hair swept up in curls at the nape of her neck just above her hands as she nervously adjusted the jeweled necklace at her throat. The smile she wore at that moment lit her face the entire day, a testament to the vivacious and lighthearted spirit of this bride. Moments after our arrival the groom and his entourage of family and groomsmen filled the opposite end of the building with deep laughter and palpable excitement. Metal clanked against itself and the steady cadence of crutches approached. We hurried to divert our dashing groom, Chad, away from his waiting bride until we were able to prepare the couple’s first-look encounter. When we found him Chad stood proud in his dressing room, laughing and joking with his friends and soon-to-be son. Other than the cane ever-present by his side and the brace forcing his pant leg to wrap tautly around his leg, no one would have even suspected that he had suffered a traumatic injury to his leg just two weeks earlier. It was clear that Chad would let nothing stop him from marrying his bride and creating a family with her from this day forward. Even though we knew Chad was a trooper, we wanted to be mindful of his comfort throughout the day. 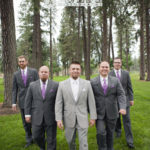 The Coeur d’Alene Wedding Chapel’s garden and grounds offered us several picturesque areas to photograph the couple and their wedding party without putting undue strain on our groom. We began the day’s adventure with the “First-Look” location. 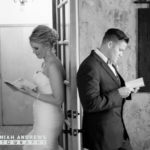 Chad and Katie wanted to exchange notes they had lovingly hand-written each other prior to seeing one another on their wedding day; a beautiful, private sentiment. We led Chad to a quiet room away from the rest of the group and had him stand with his back against an open hallway door. We brought Katie through the hall to the other side of the door. Back to back, the couple reached tentatively around the door and gently held each others hand before exchanging notes. They opened the notes in silence, each wiping away joyful tears as they read. 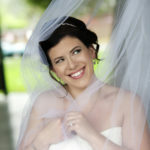 Soon enough the tears turned to laughter and Katie shyly crept around the door to see her man. The first-look is often the most heart-felt and emotionally evocative moment of the day for us … this day was no exception. We let the couple talk and adore the sight of one another for as long as we could before excited family started spilling into the room. As much as everyone wanted to start the festivities early, we knew there was still much to do before the “I Do’s”. A break in the rain gave us good reason to round-up the handsomely dressed wedding party and head outside for group pictures. Instead of trying to hide Chad’s injury, the couple encouraged us to incorporate it into the images of the day: We playfully used crutches to create a saber arch over the couple while the wedding party threw out their best jazz hands and theatrical poses; Chad made Katie giggle in a candid moment while balancing in a child-like swinging pose at the front entrance of the chapel; The groom and his court sat in the garden feigning sophistication while showing off colorful socks (and Chad’s brace); and Chad’s use of his cane while dancing at the reception was truly a sight to be had! 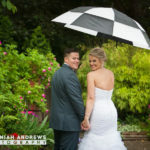 As the rain picked up again and guests began to trickle in, we returned to the inner rooms of the chapel for privacy and some one-on-one time with the bride and groom. 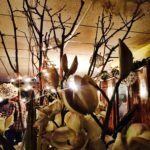 We chose to photograph in the groom’s dressing room because of the unique stained-glass windows along one wall and the rich woodwork throughout. 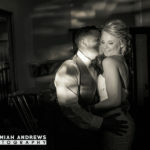 The shadows played on the faces and bodies of the couple, offering dramatic lighting and sultry composition. We wanted to offer a timeless look at this couple’s love and affection for one another without reminding the viewer of Chad’s compromised state. Sure, it was fun to capture images which poked fun at the unfortunate timing of the injury, but this is a stunning couple and they deserve to be photographed well also. 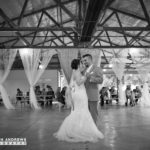 During the ceremony the couple exchanged personal vows of love, loyalty, and deep commitment to build each other up in Godly faith. Not a dry eye remained after Chad knelt down and gently spoke directly to Katie’s son. He vowed to not only honor his bride, but stand as a loving and nurturing father to the boy forever more. As should be expected, this amazing couple is loved and supported by some pretty outstanding family and friends. 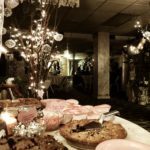 The wedding reception was filled with joy, laughter, scrumptious food, sweet homemade treats, and sooo much lively dancing! Speeches made drew a picture of two wonderful people who had been living fulfilling lives separately, yet waiting for partners who appreciated the deep bounty they had to offer. Clearly, their faith and strong personal character would lend themselves well to building a lasting bond between these two gentile souls. We snuck away from the celebration while the party was in full dance mode. The clouds had parted, and stars shone brightly in the crispy, night sky. The passing of the rain and the exhilarating warmth which radiated from inside us made us appreciate the tepid evening air. As we drove away and I replayed the day’s events in my mind, I was reminded of 2 Corinthians 4:17 (NLT) “For our present troubles are small and won’t last very long. Yet they produce for us a glory that vastly outweighs them and will last forever!” I believe Chad and Katie take the truth in this statement to heart … Not just in their acceptance of larger life events (such as past heartaches), but also the grace with which they handle smaller annoyances (like a broken leg on their wedding day). We honor their humble spirits and wish them a lifetime of joy together! Jeremiah and I have an infinite soft spot for blended families. Watching Katie’s heart fill with love for her groom as he poured his love out to his new son was just the kind of thing that makes our hearts brim with hope. Parenting is difficult, and step-parenting exponentially more so. However, with the right heart toward the children involved, there can be so much healing and closeness that comes from the creation of a new family unit. Indoor wedding and reception venues offer year-round convenience, romantic backdrops, and cozy nooks … where they challenge photographers is in color, light, and space. 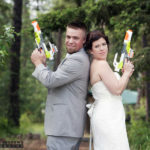 Jeremiah knows the ins-and-outs of photographing at the Coeur d’Alene Wedding Chapel better than any other venue; he has photographed more weddings in this particular venue than any other in his career. 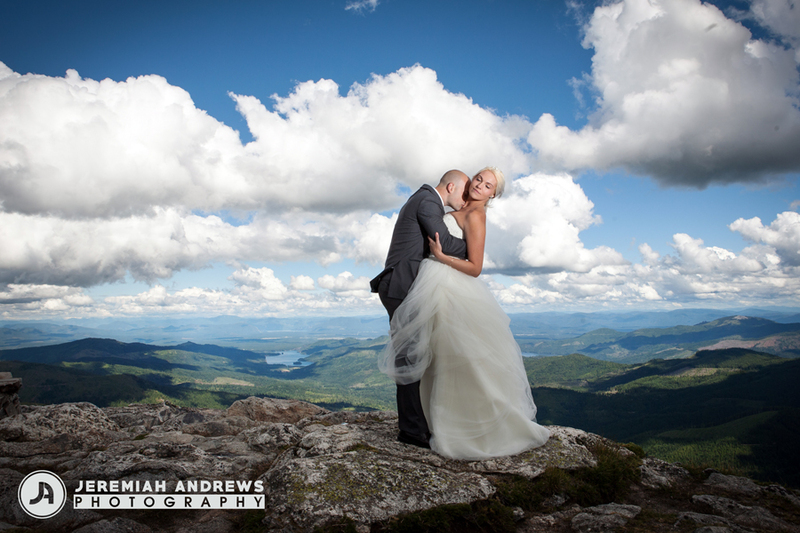 In fact, the first wedding he photographed was at this exact location! Here are a few points he is mindful of while photographing here. The wedding chapel offers natural lighting which originates from intricate stained-glass windows lining the outer walls. While the ambient light is warm and comforting, the light that shows up in pictures is more orange than is appealing; Jeremiah must adjust the temperature of the images to offset. While some color temperature can be adjusted during editing, he also knows to make critical adjustments during the shoot. Dark composition can create captivation, moody images, but it can also make the subjects dull and poorly defined. Jeremiah uses natural light whenever possible. However, he supplements the available natural light with bounce flash and off-camera flash. The bounce flash ‘bounces’ light off of the ceiling or adjacent light surface to minimize the appearance of “crazy shadow people” behind his subjects while lending more light to the overall space. Off-camera flash helps us add definition to specific details in the image. While lighting can be manipulated, Jeremiah must work within the limitations of space in any indoor venue. This proves challenging when Jeremiah photographs large-group shots during the festivities of the reception. Many would-be subjects naturally turn away from a camera creating disjointed group images. Jeremiah gives subtle direction to his subjects to maximize available space (and light). 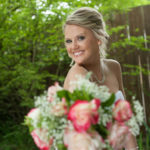 Beautiful blonde bride raises her pastel bouquet to the sky offering a side view of her ruffled mermaid gown. 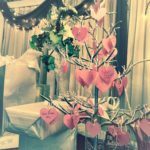 White and silver gilded presents atop the gift table sit next to a sweet note tree full of loving words for the newlyweds. 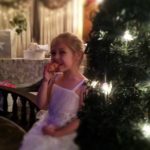 Shy flower girl takes a break from dancing during the wedding reception to steal a sweet dessert from the decadent spread of homemade treats. The ladies of this family pulled out all the stops when preparing all of the sweet reception desserts by hand… one more delicious than the last. 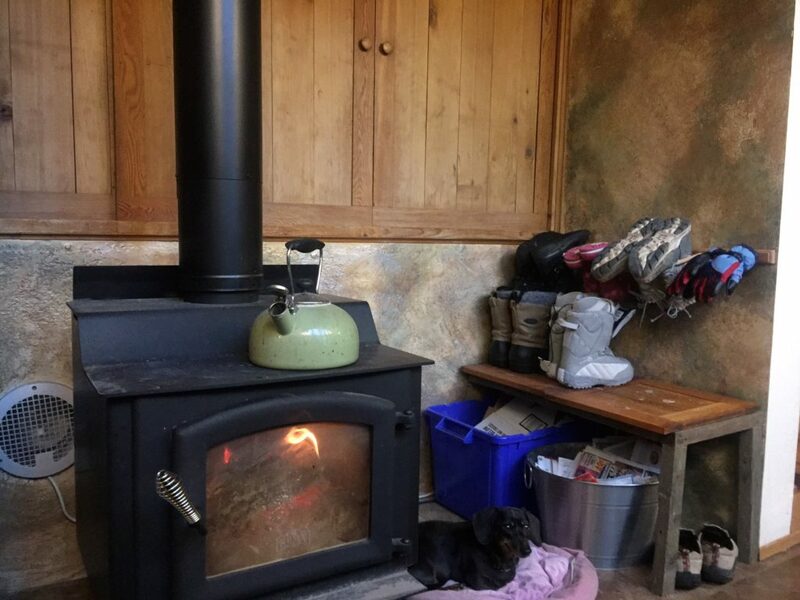 All summer our wood stove, and the ramshackle alcove in which it resides, goes unnoticed and unattended. Unfortunately, as soon as the wetter weather of October and November rolls around we realize we have a muddy, overrun mess on our hands. Soggy boots dripping into the walkway; newspaper and kindling precariously stacked against the wall; and wadded, wet socks or gloves dotting it all like some sad, dirty garnish. Besides the obvious visual grossness, we had operational issues to address. The wood stove put out too much heat on the main floor and bedrooms above, but the split-level adjoining daylight basement was bitterly cold without additional (costly) heating. I have meant to tackle the project of updating and organizing this mess for three winters … now that it’s done, I can’t believe we waited so long! The project took approximately 10 hours to complete, spread over two days (to allow for drywall compound drying time) and was fairly simple. Totally worth it! First, (because neither Jeremiah nor I enjoy electrocution … and we couldn’t determine the exact electrical circuit to isolate) we turned the house’s electrical main ‘off’. 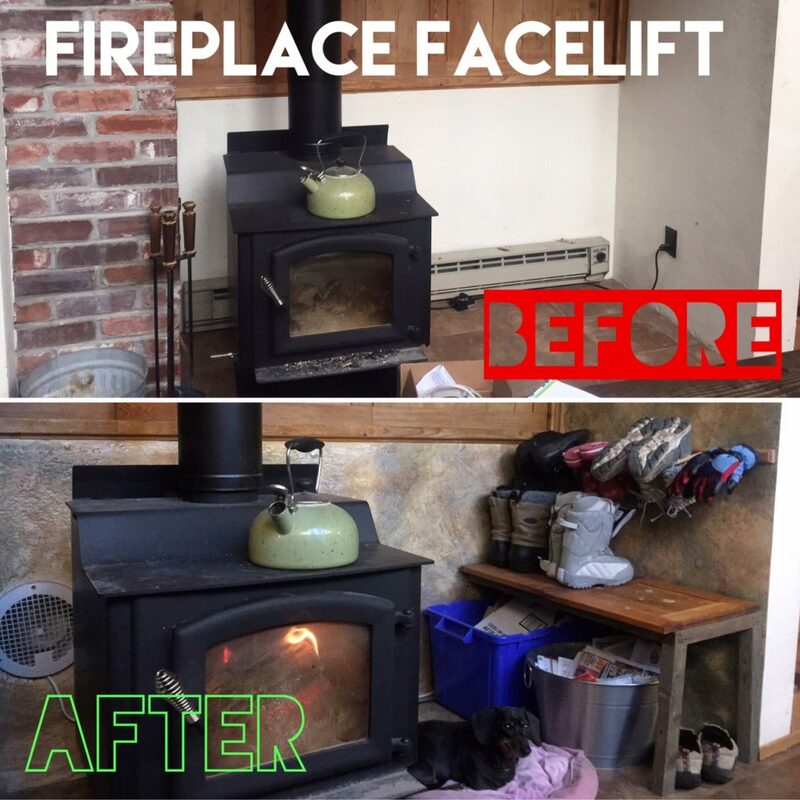 We then removed the baseboard heater unit that had been installed years earlier behind the wood stove. 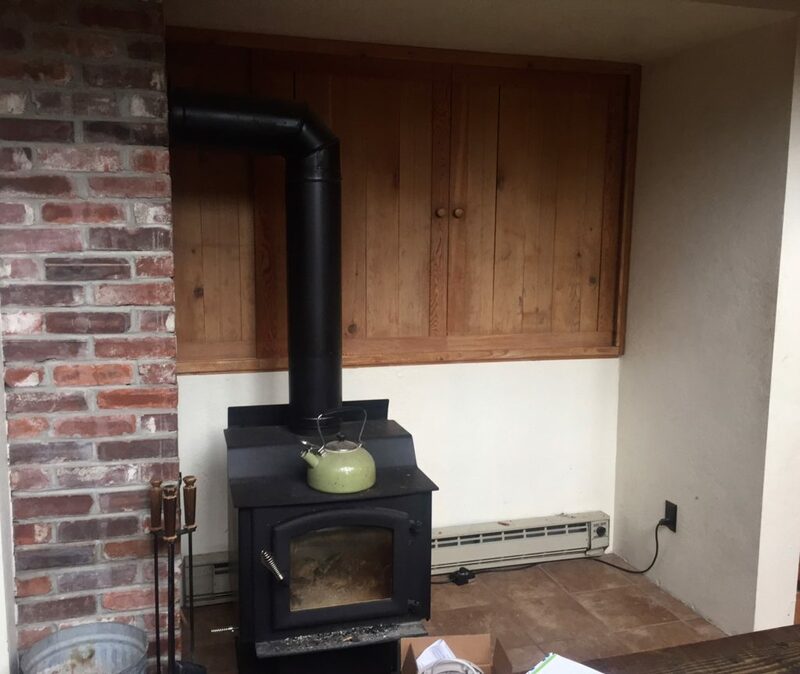 Don’t ask me why a heater was installed behind a wood stove … I would probably have to blame the 1970’s. I installed and mounted a plastic electrical box at the base of the wall, routed the electrical wire from the removed heater into the box, capped the electrical wires (adding electrical tape for good measure), and repaired the drywall surrounding the new electrical box with mesh tape and low-dust drywall compound. It is NEVER a good idea to just bury capped live wires in the wall. A dedicated electrical box and blank faceplate remind you that those wires exist and keeps the electrical current safely housed until it is needed again. Meanwhile, Jeremiah kept busy cutting holes in the wall behind the wood stove for the through-wall vent fan. We knew we would be challenged in this project because of varied wall thickness in this part of the house. (Remember, it’s split-level to the basement.) We cut the wall on the basement side first to ensure the finished face-plate position did not interfere with another heater vent close-by. 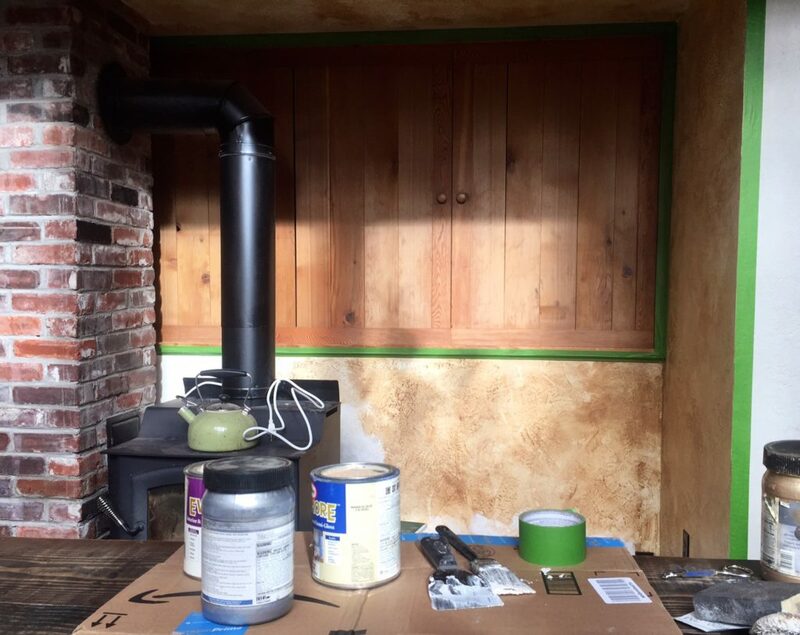 After fighting with some unruly surprise plywood while we made our way through the wall, we used the outside edge of a level to aid us in marking the outline of our cut hole on the backside (inside the wall) of the fireplace alcove wall. We located the center point of the proposed second hole and drilled a pilot hole through to the main floor. We returned upstairs, centered the connecting vent pipe over our pilot hole, and traced its outline. Jeremiah used the pilot hole to easily start cutting the drywall away, revealing a beautiful straight shot through both levels of the wall … success! By far, the most complicated part of the project. The through-wall fan installed quickly. We ran the electrical cord through our cut holes first, then slid the opposing ends of the vent ducting together easily. We sealed the connection point of the two sides with metal tape (available at most hardware stores) to ensure minimal lost air and mounted the fan covers to the walls, securing the fan’s placement. For aesthetics, I used cable staples to tack the power cord along the baseboard as it travels to its power source under the new bench. Where the baseboard heater was removed, and other areas significantly patched in the repair of the drywall, we needed to recreate and blend the wall’s texture. Don’t try to skip over the re-texturing step if you want your finished paint job to be of any quality! I used fans to speed drying time of the drywall compound after repairs because I am woefully impatient. I sanded the repaired areas smooth and reapplied a spotty (and slightly thinned down) coat of compound using a 2″ paint brush. 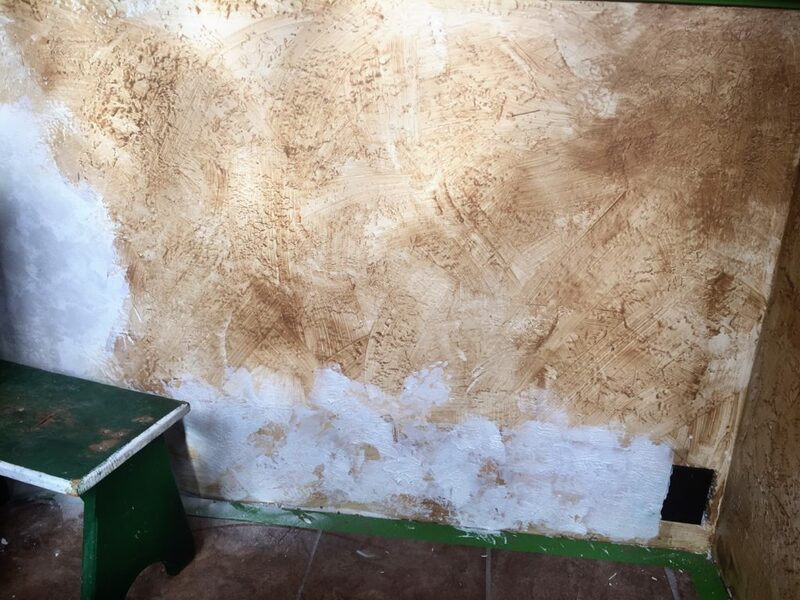 When the compound was barely dry to the touch I used a putty knife to ‘knock down’ the peaks, effectively flattening the texture to match the existing wall. 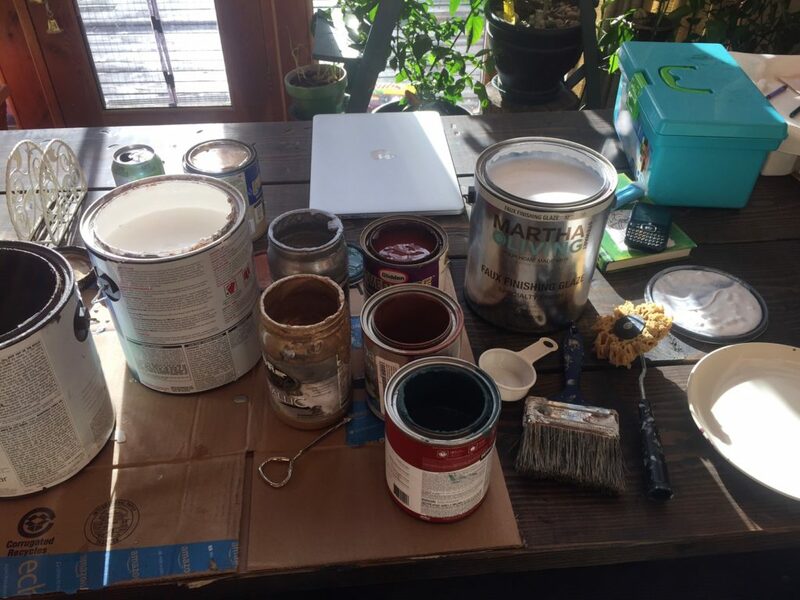 Here we arrive at my favorite part of any project … painting! I love to challenge the color palate in our home to be complimentary yet non-traditional. I maintain cohesion between rooms (which makes my senses happy) by sticking to the use of one off-white tone, throughout, as a base for all other color combinations. This color theory was important to follow since I was working in the center of our main living/dining area … the very ‘heart’ of our home. The fireplace alcove is in the center of our dining room. At one end, the dining room opens to a tranquil peacock blue library and on the other end, a gothic maroon kitchen. I wanted to have hints of both colors in the dining room without weighing the room down in color … or causing vertigo. A faux-finish was a just the ticket! I layered four paint colors (a camel brown, deep jewel blue, burnt sienna red, and wet slate grey) between silver and copper metallic glazes … applied with dry-brush, splatter, sponge, and ragging techniques as needed to create the end effect. The metallic glazes brought out a milky, iridescent shimmer in the paints that I hadn’t expected, but really enjoy. While the paint was drying I rummaged through my scrap wood pile to make the shelf and boot hanger come to life. I was able to repurpose some lumber from a disassembled garden enclosure for the legs and shelf frame. I love the look of the naturally aged wood. The shelf top was serendipity’s gift of two perfectly sized cabinet doors from the old kitchen (hinges and all). The quirky, lift-top action on such a low shelf makes the storage underneath much more accessible. I mounted the shelf to the wall with drywall anchors and L-brackets for added support. 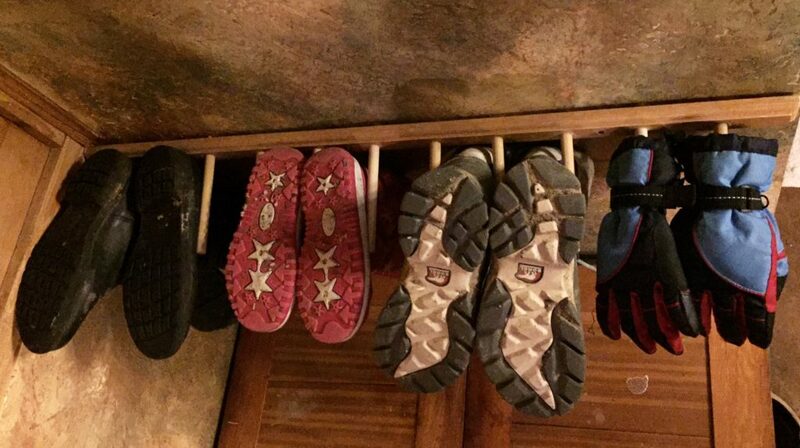 A solid piece of discarded trim, a few well-placed holes and enough 6″ dowels to hold 10 pair of boots upside down was all this boot hanger required. I feel it fair to mention that I glued the dowels in place once I liked the design (1″x3″x34″ lumber as back; 11 holes for pegs are spaced 3.25″ apart on the back; approx. 5″ of dowel is exposed for each of the pegs after dowels are tapped into back until flush). I also used drywall anchors to secure the boot hanger to the wall. I didn’t want any near-term drywall repairs in here! I hung three hat and jacket hangers close to the top of the alcove (not shown in images) to dry those items without crowding. 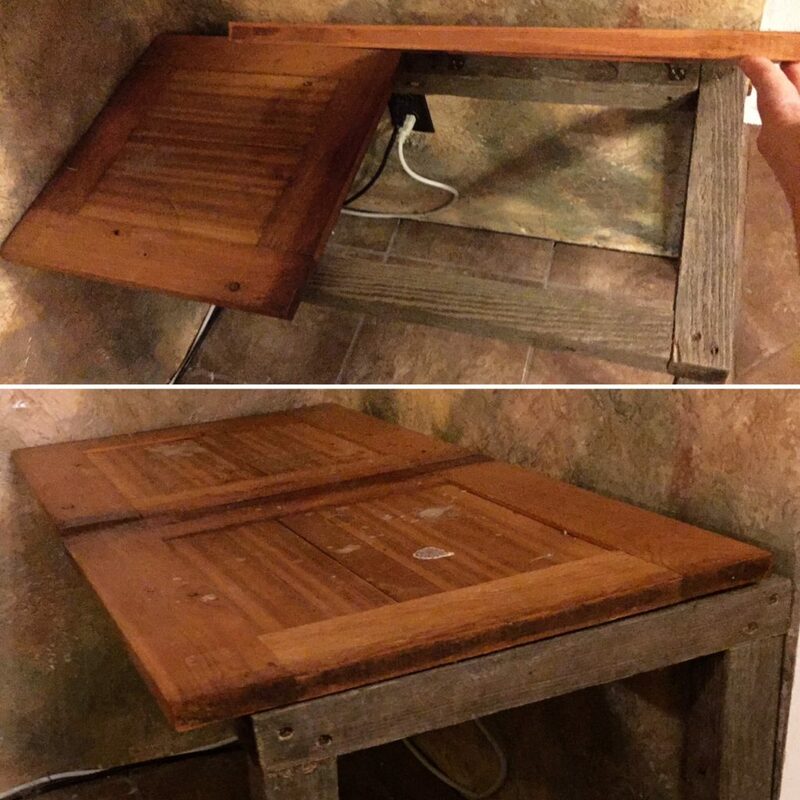 It was no problem to neatly replace all of the original items without even the slightest hint of a mess. The dogs are super excited they can snuggle up close to the fire too. Now, winter jackets and wet accessories won’t be a bothersome eye-sore, and we have added heat in the basement. Bring on the slush and snow! What a great ‘before’ and ‘after’, right?! I hope you like the images and process I have shown here. Please share this article and check out other topics on the blog … I love feedback and shared experiences as well. Q’emiln Park stretches along the south bank of the Spokane River in Post Falls, Idaho. This family-friendly, waterfront public park maintains four covered entertaining areas (shelters) available for seasonal event rental. 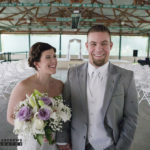 This venue is perfect for the bride and groom looking for a venue with water views, reasonable price point, easy access, and lots of room to roam. The Grand Pavilion area used by Mike and Lena is a large, open-air pavilion which looks across the park’s grassy knolls to the shimmering Spokane River beyond. On this particular day we were especially glad for the pavilion’s built in heaters and clear, roll-down window walls. You see, while the moody and dark skies of this early summer day added to the striking natural beauty of the surroundings, the weather left us all chilled and a bit damp. 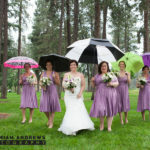 Luckily, this adventurous couple and their bridal party would not be deterred from venturing out from under the cover of the pavilion for photographs. Mother Nature rolled up her sleeves and teased us with sunny skies followed quickly by flash rain showers. We incorporated the lovely tulle draped throughout the pavilion, some fun and vibrant umbrellas, and lots of tree canopy coverage to achieve our photo images of this special day. The bride was stunning in an enchanting ivory corset bodice mermaid style lace gown. She opted to forego the use of a veil, instead, sweeping her chestnut brown hair into an elegant up-do crowned by a rhinestone embellished headband . 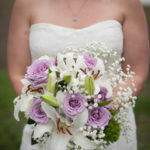 The girls’ bouquets paired delicate white lilies with dusty lilac roses, sprigs of baby’s breath and a hint of green (tying the color scheme to bridesmaid dresses and the natural setting). 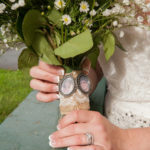 We loved the sweet sentiment of the remembrance picture locket pinned into Lena’s bouquet. 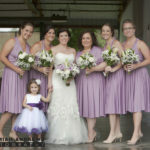 Bridesmaids wore silky, tea-length dusty lilac dresses which paired nicely with the gunmetal grey suits of the groomsmen. 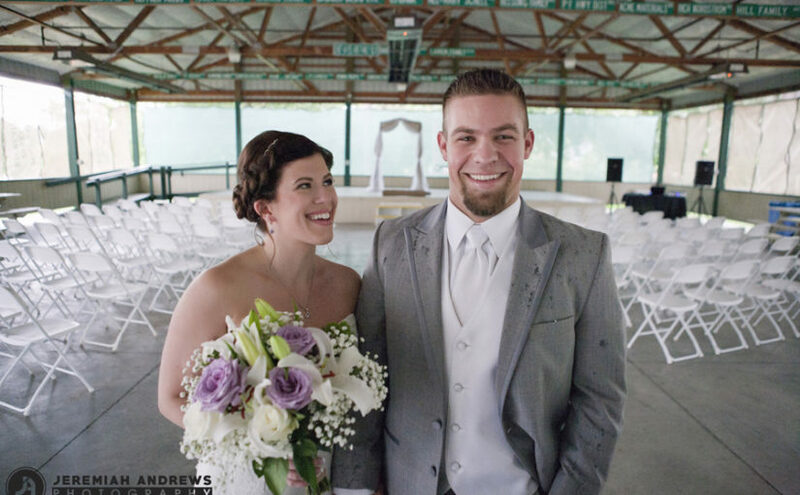 Our groom looked dapper in his contrasting light grey suit and white accessories. 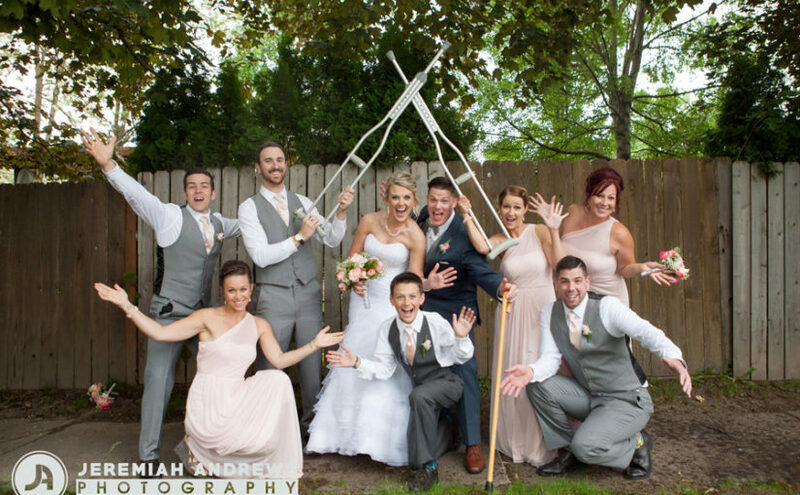 Mike and Lena created a fuss-free wedding day by enlisting their family and friends’ help with food and decorations. 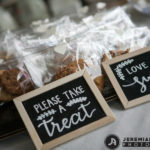 A finger food buffet, tempting homemade desserts, whimsical painted wine bottle centerpieces, and fun glass mug keepsakes with chalkboard style name tags added personality without breaking the couple’s nest egg. Mike and Lena share an undeniable bond, but the connection between Lena and her siblings (brother and sister) was especially touching and significant. 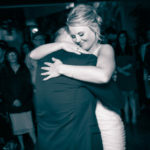 After the married couple’s introductory first dance, Lena was led by the hand back onto the dance floor by her sister and joined, immediately, by their brother. The three hugged, laughed, and shed tears together while the music played … It was as if only they three occupied that special moment. The rest of us looked on at the love and support shared and couldn’t help but be moved by the display. 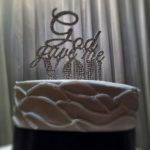 Unexpected things pop up during every wedding celebration. 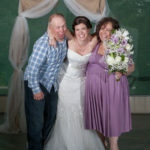 As professionals, we try to allow extra time during a wedding photo session for such SNAFUs. Case in point: a few hours before the ceremony, one of the groomsmen became unable to attend (or be a part of) Mike and Lena’s wedding. 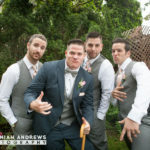 A replacement groomsman was quickly brought on-board, but all full-group wedding party pictures had to be delayed by over an hour waiting for the new groomsman to get ready and arrive. The ample time we set aside to complete the day’s photography doesn’t just allow us to capture candid images of the couple in varied setting, it takes the urgency (and resulting stress) out of the day. 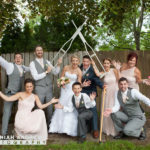 We simply photographed different sub groups of the wedding party until our latecomer arrived … then away we went without missing a beat (or image). Those of you who have followed our blogs for any time have, undoubtedly, stumbled across the article written in March of 2015 titled, “Bella the Champion“. 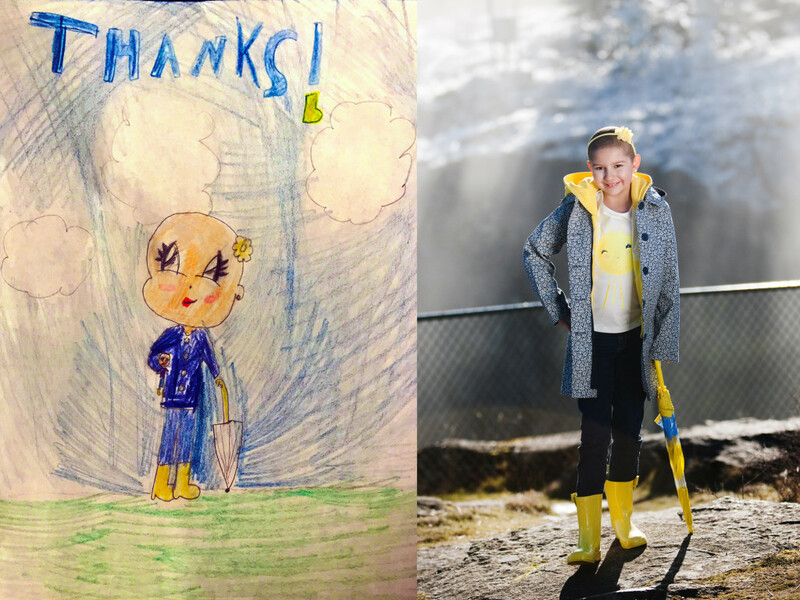 If you missed it, I highly suggest you take a look inside this courageous girl’s battle with a rare form of cancer … you can’t help but be stirred by her strength and resilience. Obviously, this article still lives warmly nuzzled against my heart, and its’ subjects remain the focus of many personal prayers. Since our meeting, we often talk about our time with Bella and her family … wondering how they are and what they are up to now. Because (I believe) God has an amazing sense of humor, we got answers to our questions in a rather unceremonious fashion. While on a high school senior photography session, we found ourselves by the “Bowl and Pitcher” rock formation inside Riverside State Park (Spokane, Washington). The shoot was progressing well and we were in the zone to create some beautiful images for our vivacious client, Kylee. As fate would have it, a playful child on the walkway above hurled rocks blindly over the bridge’s handrail (nearly battering us and our sweet client before we could really make a go of the shoot). We hollered at our unseen assailant, and the rain of brimstone subsided. Our objections heeded, we moved on and eventually worked our way back up to the mouth of the suspension bridge. Almost as if on some serendipitous cue, Bella’s younger brother and lovely, raven-haired mother stood at the entrance to the bridge shyly waving and apologizing through their laughter. The mother’s smile and kind eyes immediately recognizable; the subtle humor in her voice had not dulled. The love and connection we shared with their family was, at once, very present and very palpable. Come to find out, these sweet, beaming faces were also the faces of our rock-throwing assailants. 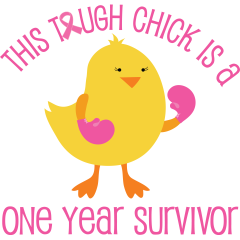 After laughing about the day’s mishap, we learned that Bella was celebrating the best news any cancer survivor could hope to receive … “REMISSION”. Her cancer, although tenacious in its battery of her body and mind, had been no match for the will of this pint-sized, wisp of a girl. Bella won this round! Time, past hardships, personal and professional demands, and all other obstacles fell away in the few moments we all talked in the shadow of the setting sun. We exchanged a laugh, a tear, an embrace, and another temporary ‘goodbye’ with Bella and her mother, knowing full-well that this is not the end of our connection to this family. We shared a brief, quiet moment of triumph with this family at the mouth of a heavily traveled foot bridge. It was spectacular … and it is what makes us love what we do. You see, we partner with our clients in life (even if only for a moment) and are privileged to be the ones who capture images of their most important moments. We are proud to share with you, our extended virtual family, Bella’s success. We know that this family’s battle is not over, and we don’t pretend that their path is easy from this point on. However, we do believe that you, (gentle reader,) also share our heart for their struggle and want to feel exhilarated and uplifted by their victories. The human spirit can overcome adversity … let this child’s determination rekindle your own passion for life. We will keep them in our hearts until we meet again to hear the next chapter in their story. Will you join us? 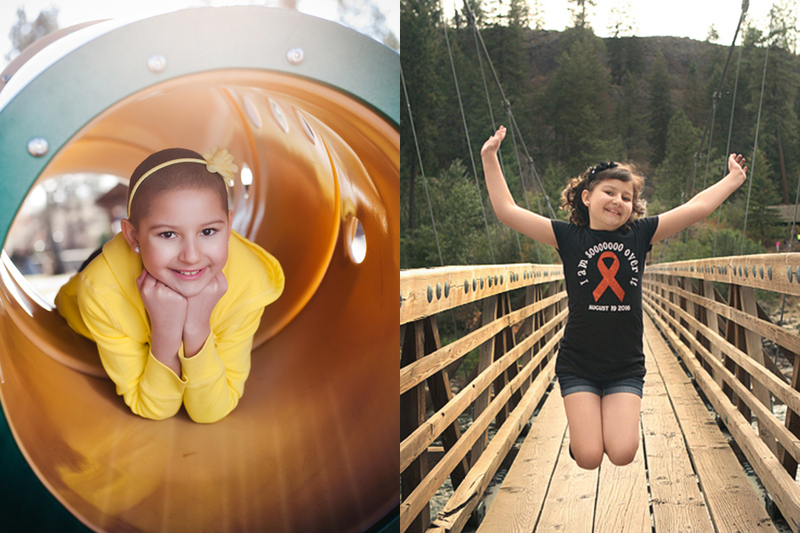 If you wish to send Bella (or her family) words of love, encouragement, and support … feel free to send them our way! We will pass them along. Your kind thoughts are a mere gesture, but the value of such a gesture goes beyond anything we can imagine. Let’s all celebrate this girl’s victory as if it were our own. Rejoice and be glad in the day you have been given. Until next time … be well, and safe travels! If you live in the panhandle of Idaho, you have probably parroted a variation of a famous Mark Twain quote without ever realizing it. “If you don’t like the weather in __________, just wait a few minutes.” I know we have teasingly uttered this phrase countless times during photo sessions hoping to calm anxious clients in the face of foreboding skies. The truth is … weather in the Pacific Northwest is predictably unpredictable, and the show must go on regardless. 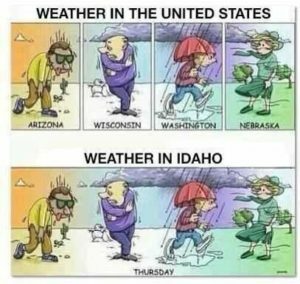 Just this past month we experienced blistering heat, menacing hail, torrential rain, freezing winds, and perfect calm … sometimes all in the same 24 hour period. Fortunately, the brides and grooms we work with not only understand this meteorological volatility, but embrace it! 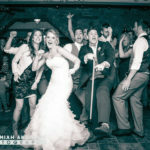 Clients who hire us to capture their family, engagement, or wedding photographs enjoy stunning, natural surroundings, and want those surroundings to be the backdrop for their special event. 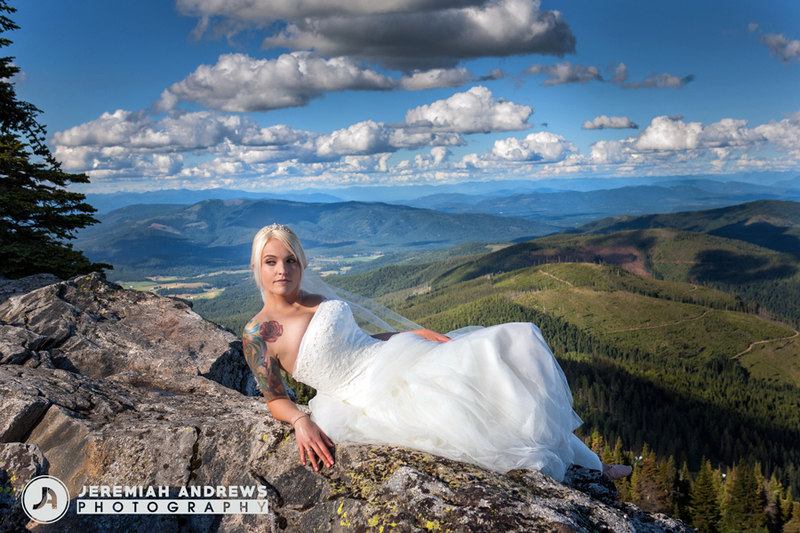 Some clients are local to Northern Idaho and Eastern Washington, and some choose to create a destination engagement or wedding celebration here because of the natural beauty. But, all of these good folks are willing to smile in the face of whatever Mother Nature dishes out. Whether high atop blustery Mt. 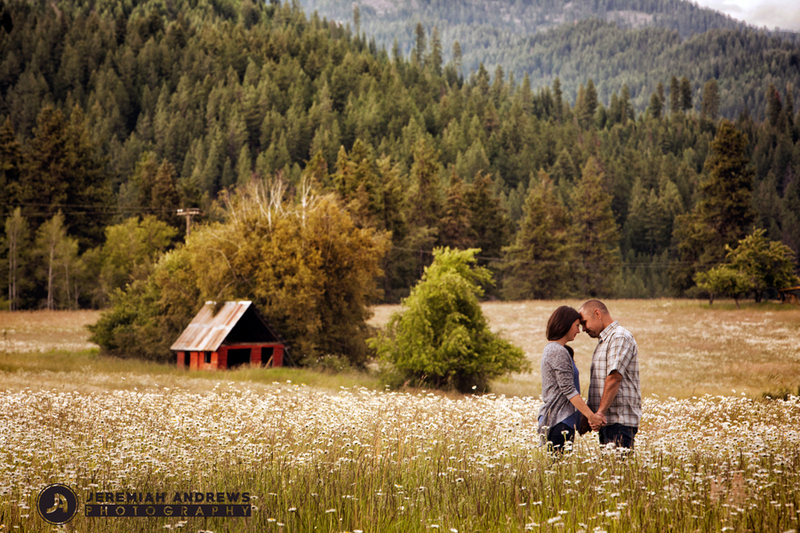 Spokane (Washington) … wading through a sun-soaked field of daisies in Sandpoint, Idaho … indulging in fanciful dress-up in a salvage yard on the outskirts of Hayden Lake, Idaho … or laughing together along the shimmering waters of Priest Lake (Idaho) … our clients’ stories of love and life come alive in the images we capture throughout this breathtaking region. We understand, our images aren’t run of the mill … but neither are our clients. In fact, we strive to blaze an exciting new path in the world of commonplace, copy-cat Pinterest images. 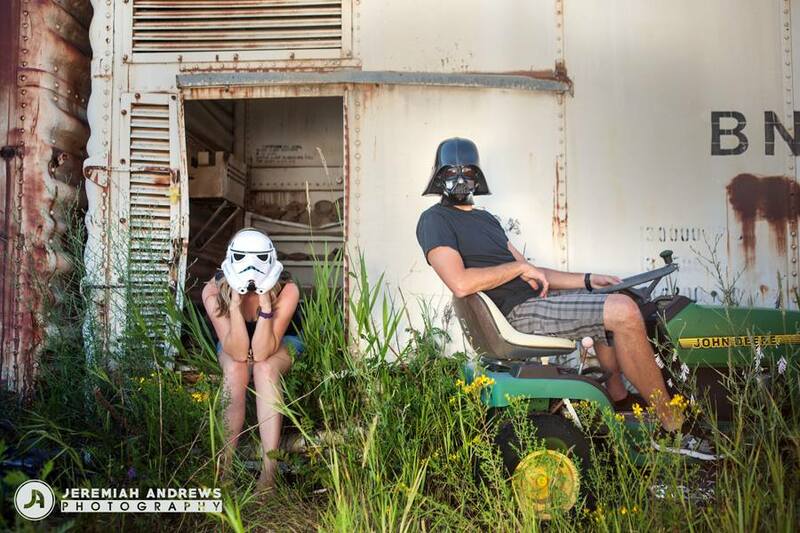 We are here to do photographic justice for the playful couple who love Star Wars almost as much as they love each other … the bride wearing a hoodie over her wedding dress while eating s’mores by a lake-side campfire … and the groom who whisks his bride off after their wedding ceremony in his vintage single-prop airplane. We celebrate their gusto and we honor them with images as vivid as the lives they lead! After all … love is alive, and adventurous, and gritty, and awe-inspiring! The Pacific Northwest embodies these qualities and never ceases to impress all of one’s senses. We are truly fortunate to work and live in such a magical region. 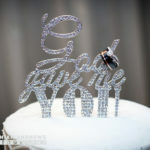 When you are ready to share your love with the world, (be it here, there, or anywhere in between,) call Jeremiah Andrews Photography to capture the images of your priceless memories! 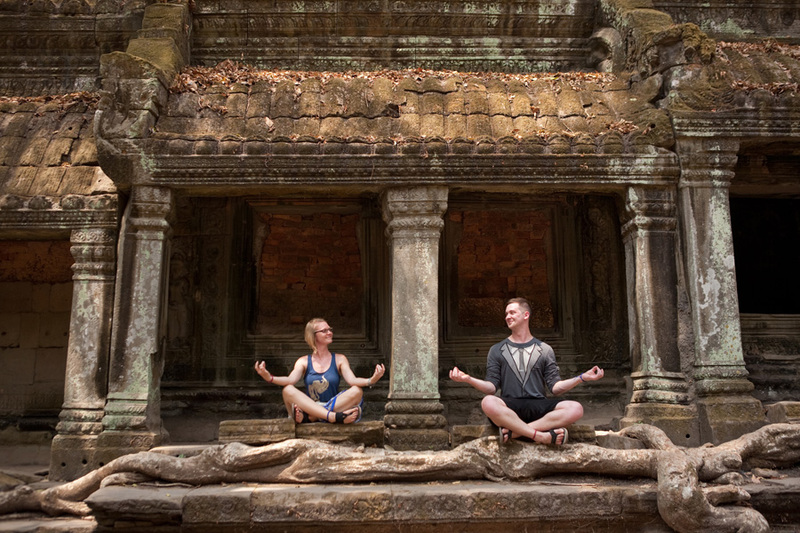 From the moment we set foot on the dusty red clay soil of Cambodia we understood that the land possesses magical powers. Its cities captivate you with their vibrant and unique personalities … its magnificent and mysterious temples inspire awe … its people are forever warm and welcoming … and the energy that pulses through it all is undeniable. 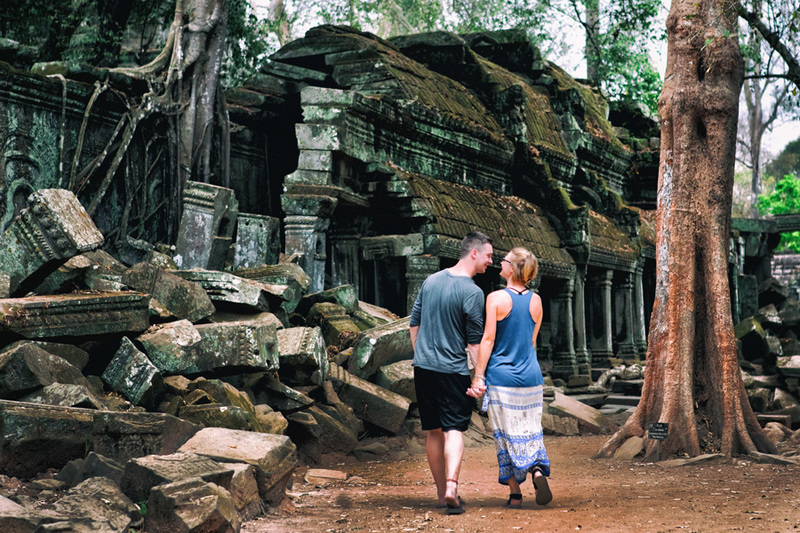 Cambodia’s intriguing natural beauty is fertile ground in which the vibrant blossom of new love blooms readily. 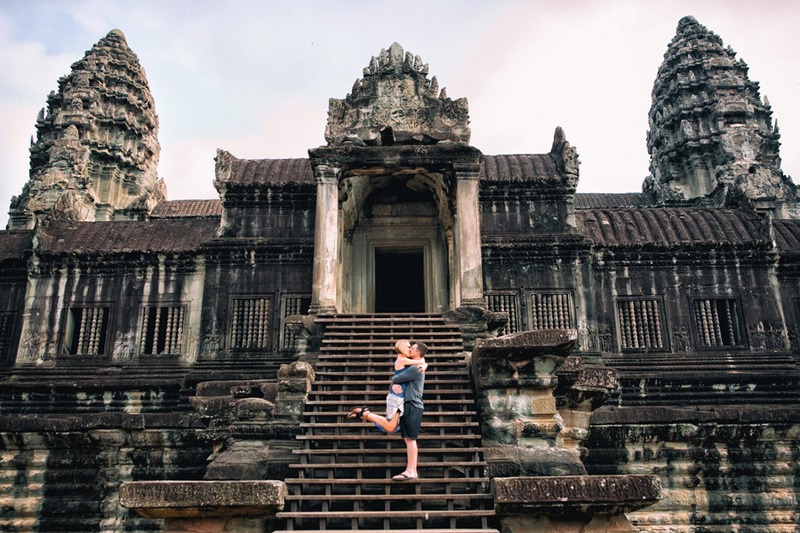 While on our most recent month in Cambodia we had the wonderful privilege of photographing our dear friend, Sara, with her love on the grounds of the Angkor Wat temples. The results are adventurous, playful, and exotic. In other words, the images are AMAZING!! Let me back up a bit … after all, our story doesn’t start here. People do not typically just call us up out of the blue and ask us to do a destination photography session (literally) on the other side of the world; This situation is no exception. 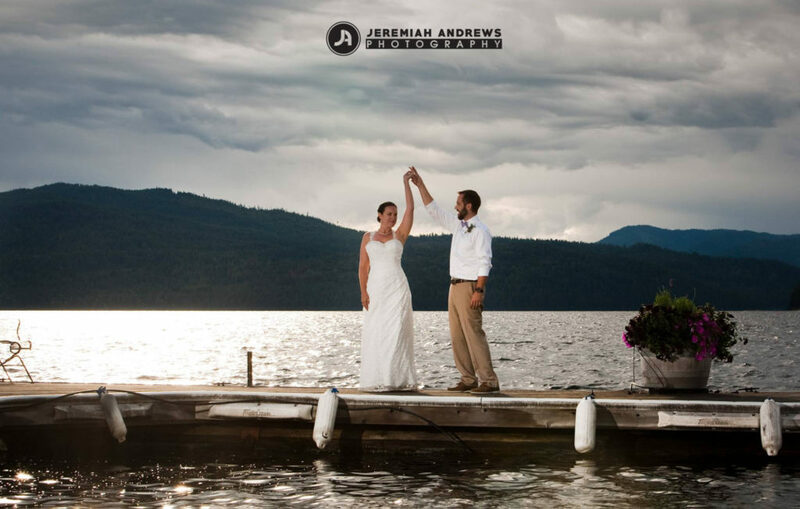 As with several of our close friends, we first met Sara through the purchase of a local Spokane/Coeur d’Alene Groupon (click here to view the Jeremiah Andrews Photography Groupon). 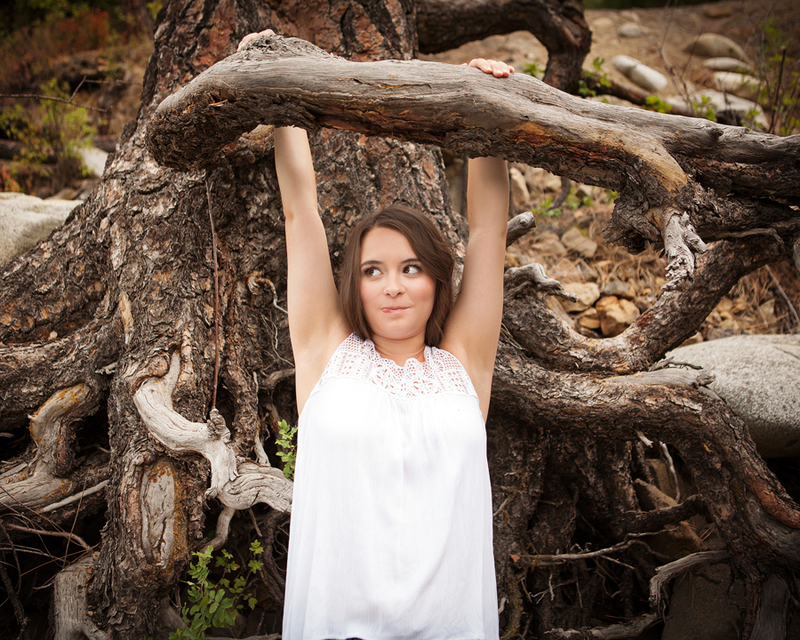 During their initial photography session, Jeremiah resonated with Sara’s zest for life and playful spirit. The two kept in touch over the years as Sara’s path led her abroad and, finally, to Hawaii for career and pleasurable pursuits. When Jeremiah and I traveled to Hawaii for a destination wedding we decided it was high-time to get old friends together. The resulting visit (and boogie-boarding hijinks) still bring broad smiles and belly laughs to each of us to this day. As we planned our most recent trip to Southeast Asia we were excited to learn that Sara, again, wanted our travel paths to cross. She and her beau, Taylor, planned to join us for a little adventure abroad and have pictures taken to commemorate their love and the trip. 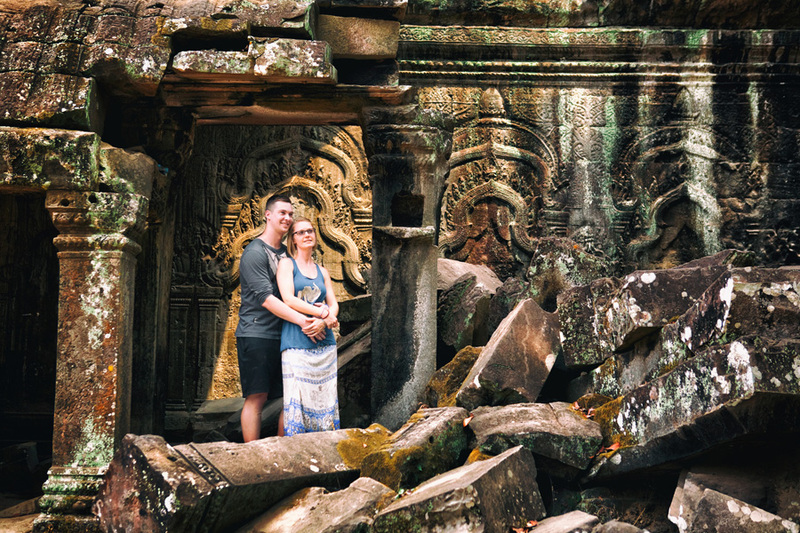 Combining our admiration of the ancient temples of Cambodia with this couple’s love of each other and adventurous spirit made the scenes come to life. 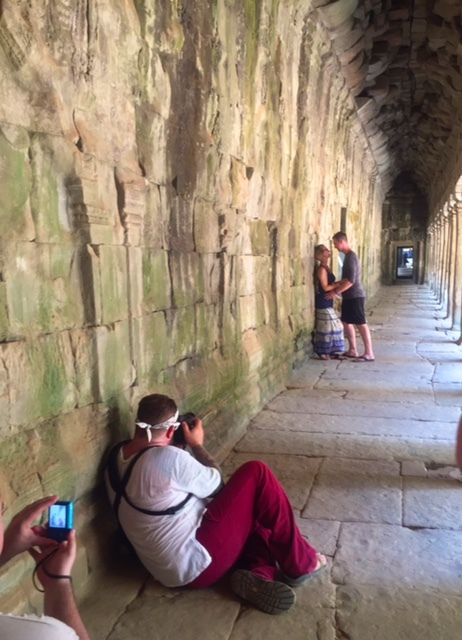 We spent two days traveling with the couple through several of the Angkor Wat temples in pursuit of killer images. We covered countless bumpy and treacherous miles between temple sites on our treks. 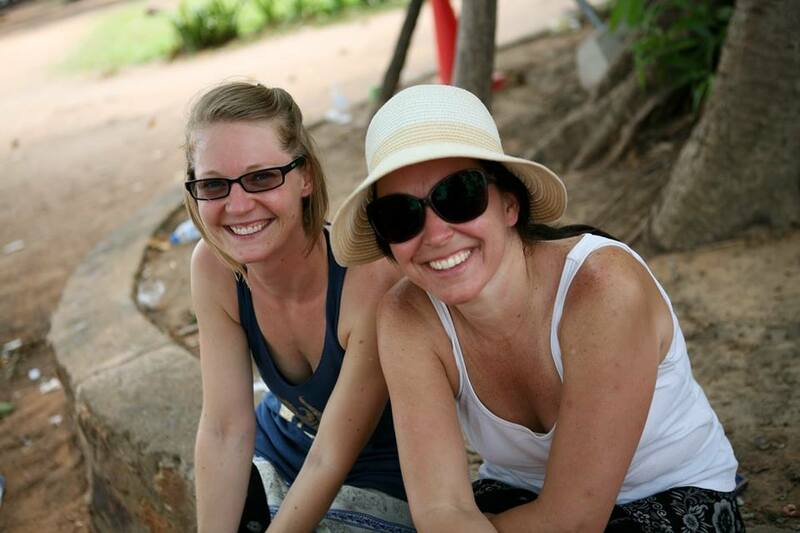 The days were overwhelmingly hot and humid but our spirits were light and happy. We laughed and enjoyed all the land had to offer during our time abroad together. Some people may not be aware of sprawling complex of Cambodian temples called “Angkor Wat” (simply translated as “City of Temples”). 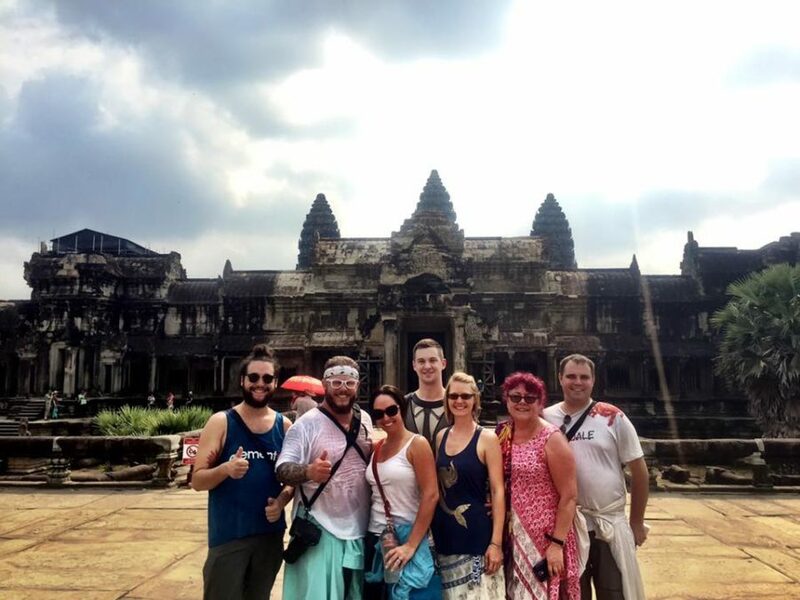 Others may be surprised to learn that Angkor Wat not only refers specifically to the capital temple most commonly envisioned by travelers, but also encompasses dozens of outlaying temples varying in age and size. 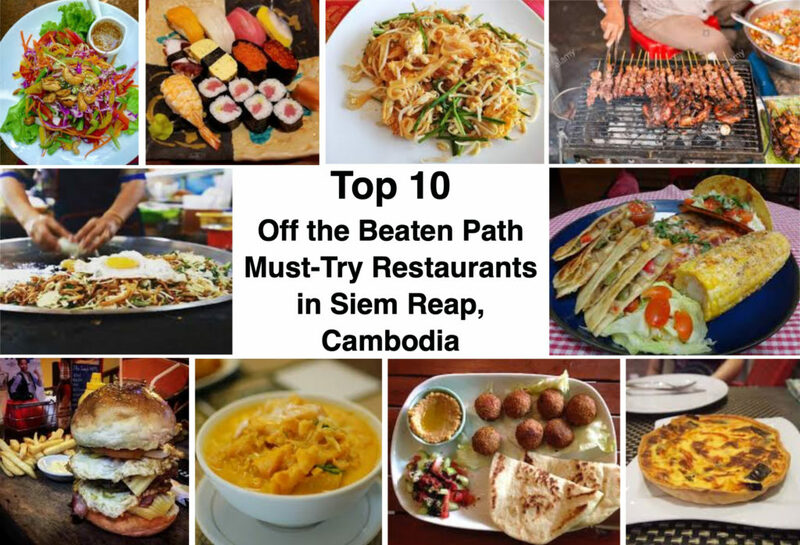 What ever your understanding is of Cambodia and its temple jewels, you owe it to yourself to learn more about these Khmer gems. They truly are among the top wonders of the world! 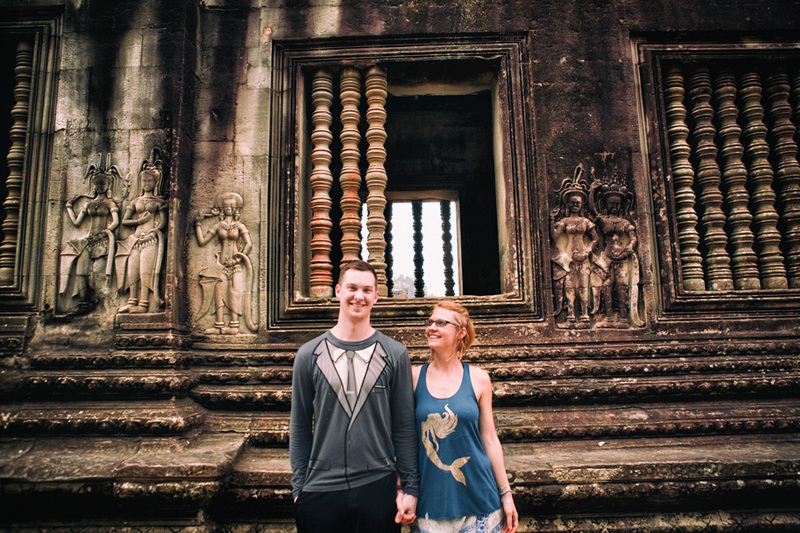 We won’t soon forget our fun in Cambodia, or the ones dear to us who shared it with us this year. We hope to return to the “Kingdom of Wonder” for other photographic opportunities as soon as we are able. 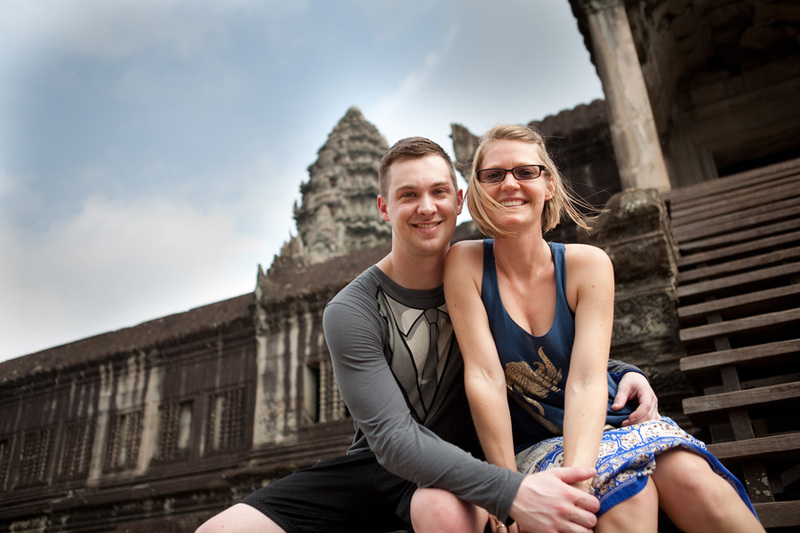 In the mean time … we hope you enjoy our images of Sara & Taylor’s time at Angkor Wat.